After years of dreaming about it, I made it at last. 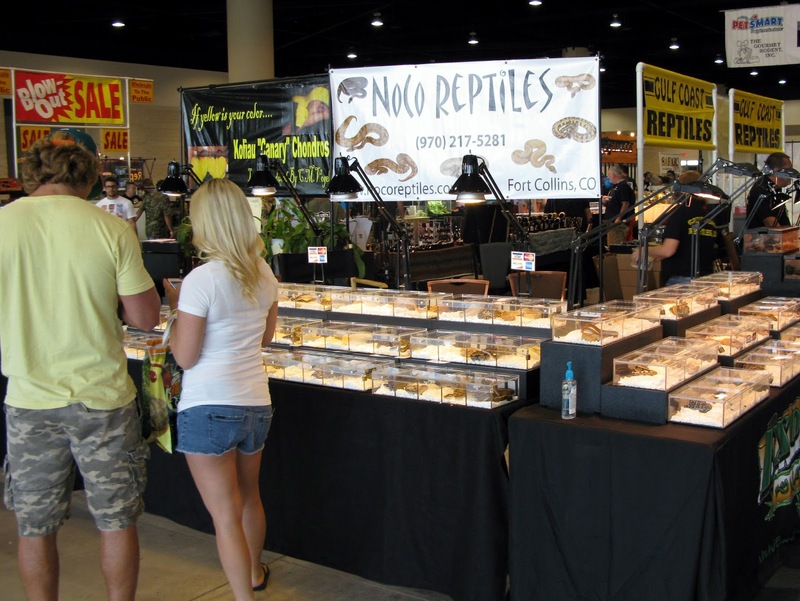 Well, after many years of hoping to attend, I finally made it down to Daytona Beach, FL for the annual National Reptile Breeders' Expo. 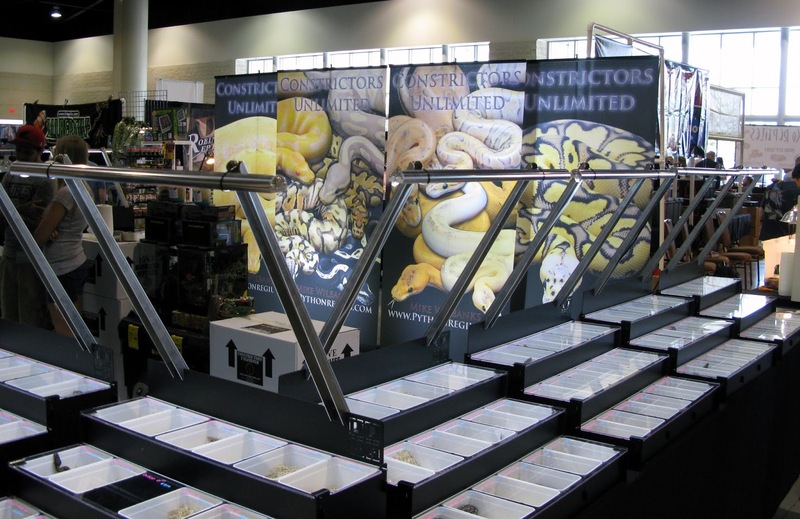 I had been warned, before I went, that it is not what it once had been, that it has gotten much smaller with fewer breeders/dealers and that in recent years it seemed little more than a showroom for ball pythons (thank you JH for preparing me). 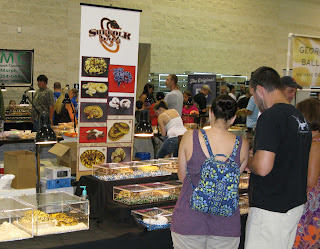 Still that did not deter me but it made me think maybe the expo should not the only reason for my trip. So instead of flying into Orlando, then driving to Daytona Beach as I had planned, I flew into West Palm Beach and visited relatives there for a couple of days. 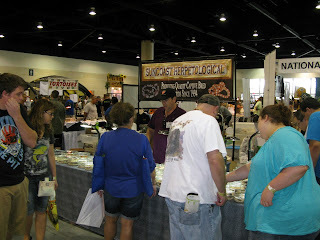 Then I drove up to Daytona Beach for the expo after which I drove back down to WPB for the rest of my week long vacation. The drive from WPB to DB was about 3 hours 45 minutes long, with the last 10 or so miles taking up 45 minutes of that time due to a traffic jam in the city. When I finally got to the Ocean Center, where the show was held, there was plenty of nearby parking available at an inside municipal parking garage for $5.00 for event attendees. 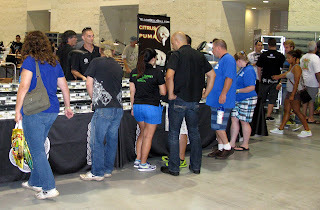 I got to the show at about 1:30PM on Saturday. I have to admit, I was a bit hot under the collar by the time I got there because of the traffic driving the last few miles crosstown, and because of knucklehead drives in that traffic, but that heat under my collar was soon cooled by a couple of fortuitous events all due to timing. First of all, I drove into the lot, paid the $5 and started to drive up the ramp. I was only about 10 cars in and a guy pulled out in front of me giving me a prime parking spot. That dropped the temperature a bit. 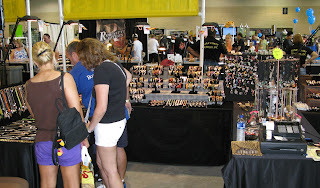 Then, when I walked into the show, which was about a block from the parking lot, I got on the line to pay the entry fee. 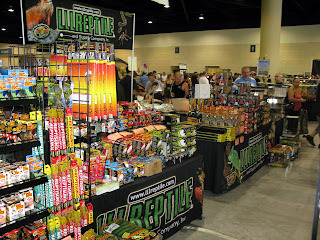 All of a sudden, a guy walks up to me (I was the last person on the line) and asks if I was going to the reptile show. Luckily for me I was not as hot under the collar as I had been a few minutes before or I may have replied with a New Yorker's reply something like: "Where the heck do you think I am going with me standing on this line you moron!". But I didn't reply like that and just said something to the effect: "Yes, of course I am". At that point, the gentleman asked if I wanted a wristband to get in (you had to wear the wristband to gain entry and reentry). Before I could say anything, he said it was free and then said it had not even been used. I said sure and he gave it to me. I thanked him profusely (I hope it was profusely enough) and I went inside. I guess that had I not been delayed in that 45 minutes of traffic I would never have gotten that parking spot and never had timed it just right to have had that gentleman ask me if I wanted his wristband. Funny how things work out sometimes, funny by fortuitous too. Then, it was into the show for me. I must say that my first impression was a disappointment but remember that was my first impression, probably my second one too, but not my final one. While the hall was big, bigger than that in which any reptile expo I have attended before was held, it was not nearly as big as I would have expected. 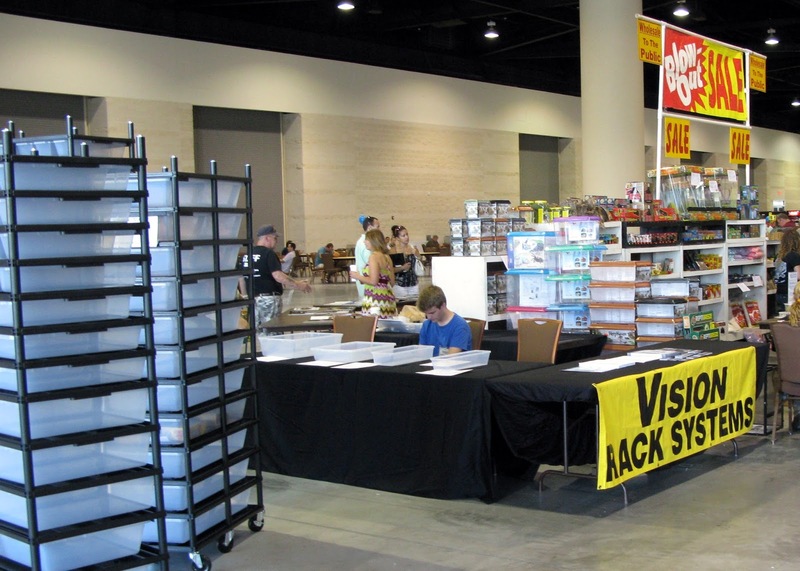 It had nowhere nearly as many dealer tables as I had anticipated. 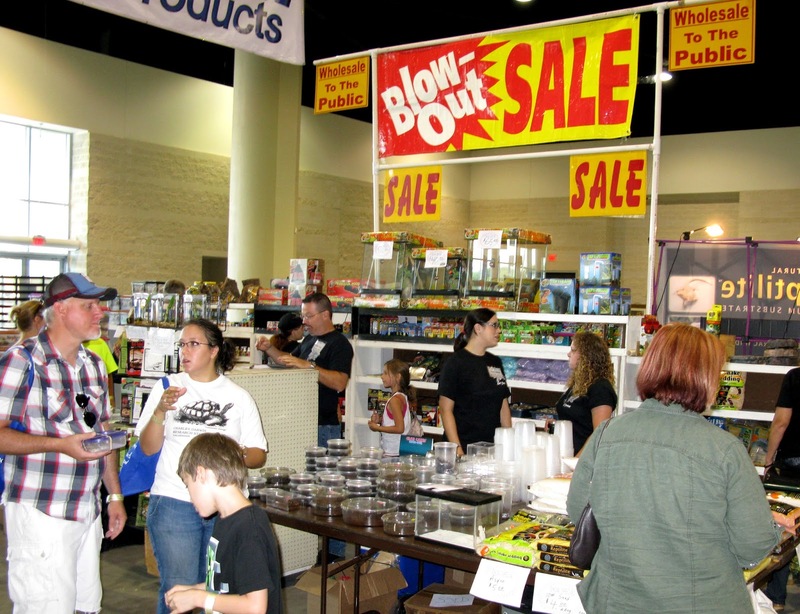 I had been warned but still thought it would be bigger or at least have more dealers (and yes there were still plenty of them). Oh well, I would walk around and see what they had to offer. Again, after my first walk around, I was disappointed again. Also again, I had been warned; it really was, or seemed to be, mostly a showcase for ball python morphs. 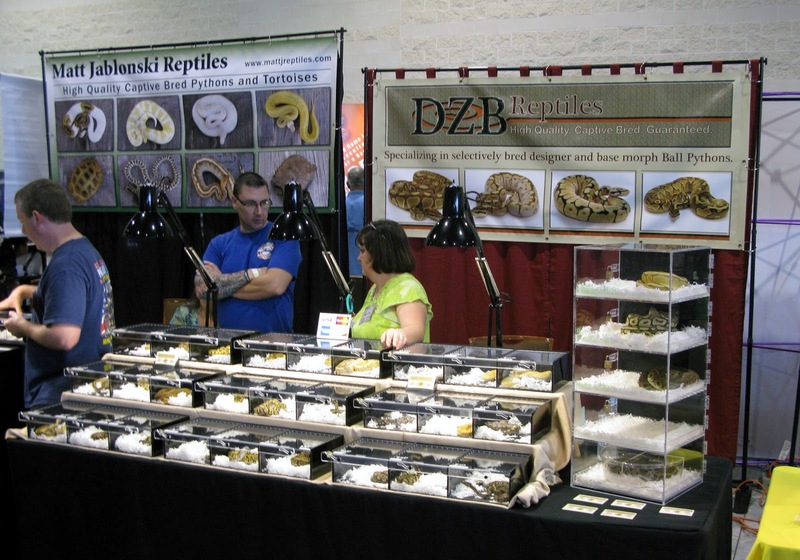 Yes there were many other herps offered but I have to say I think I have seen more general variety at the LIHS shows and at the NY Metro Reptile Expo shows in White Plains and on Long Island. 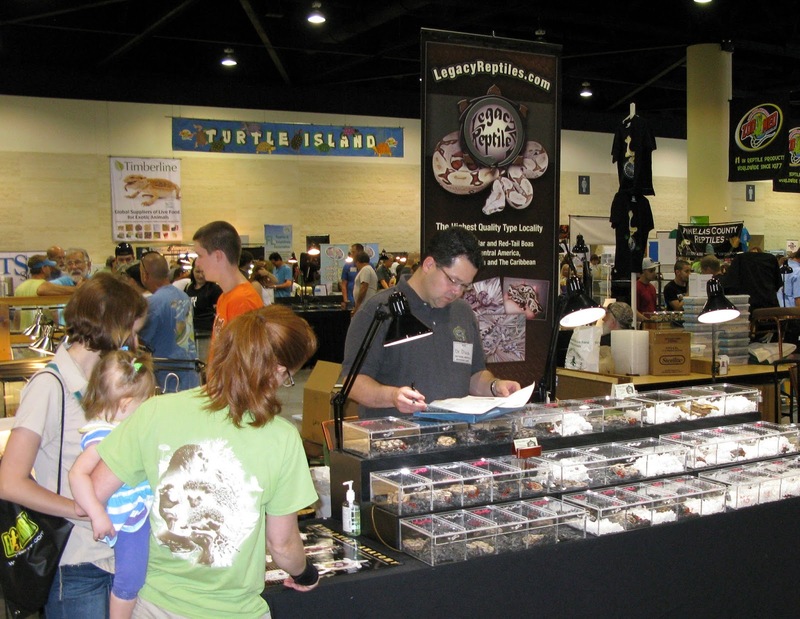 My guess would be that 35 to 40% of the animals offered for sale were ball pythons. 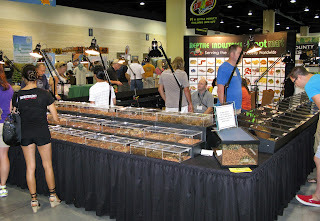 Sure - there were other snakes offered but not as wide a variety as I have seen elsewhere and as I have indicated, those on hand were far outnumbered by BPs and remember BPs seemingly, to me, outnumbered every other kind of herp at the show. 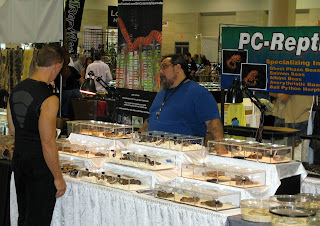 The amount of lizards at the expo was abysmal. 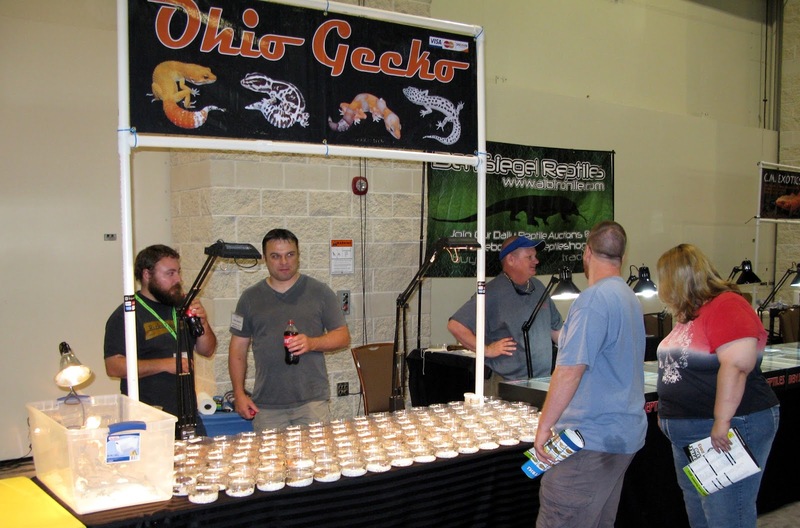 There were a few to several tables with bearded dragons, about three tables with a lot of crested geckos and some leachies (Rhacodactylus leachianus) and other odd lizards here and there - like monitors, crocodile geckos or other geckos - but not many. 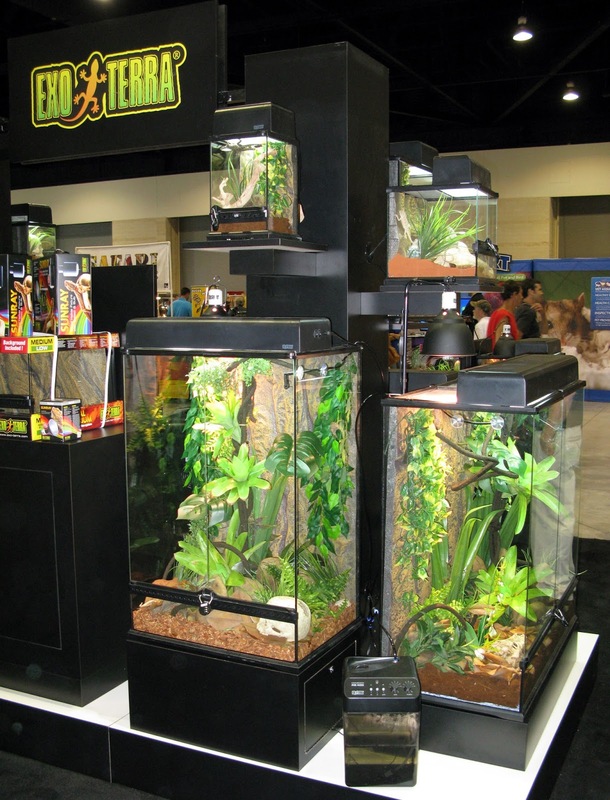 Again, they were overshadowed by the ball pythons that were in apparent overabundance. 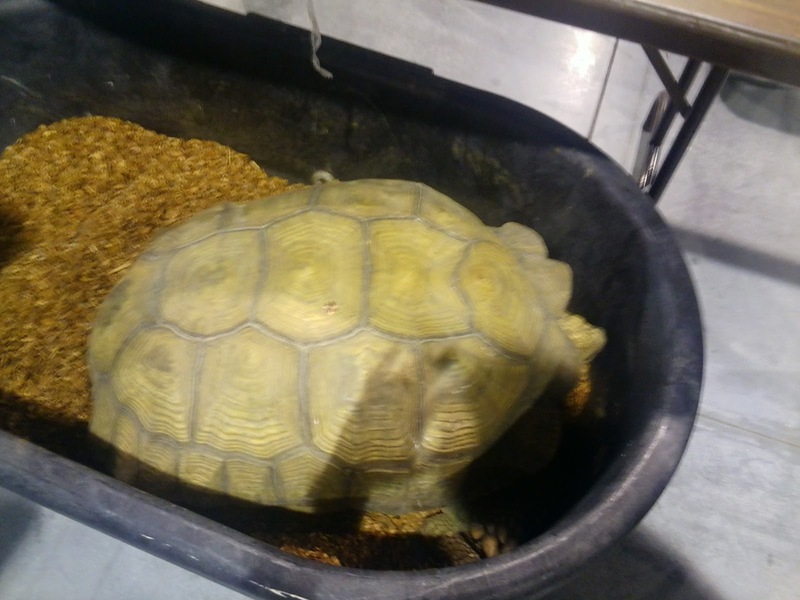 I must say, there were a good number of turtles and tortoises for sale, and they may have given the BPs a run for the money, but even in that area the show was lacking in some ways even if only for me. In general though, it had to have been a turtle and tortoise lover's paradise, there were oodles and oodles of them and very good to excellent variety. 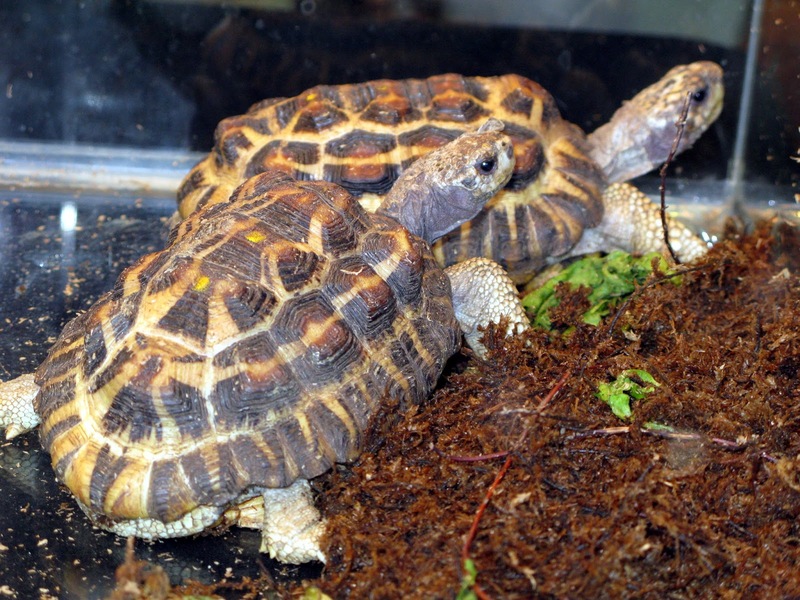 Yet, I was hoping to pick up a few baby Russian Tortoises. 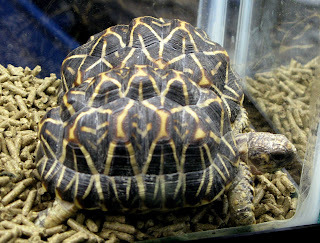 Very few Russian Tortoises (and no baby Russians) were available although, there were some captive bred ones about a year or two old. There also were a good number of Hermann's Tortoises but virtually all I saw were females and I could have used a young adult male. 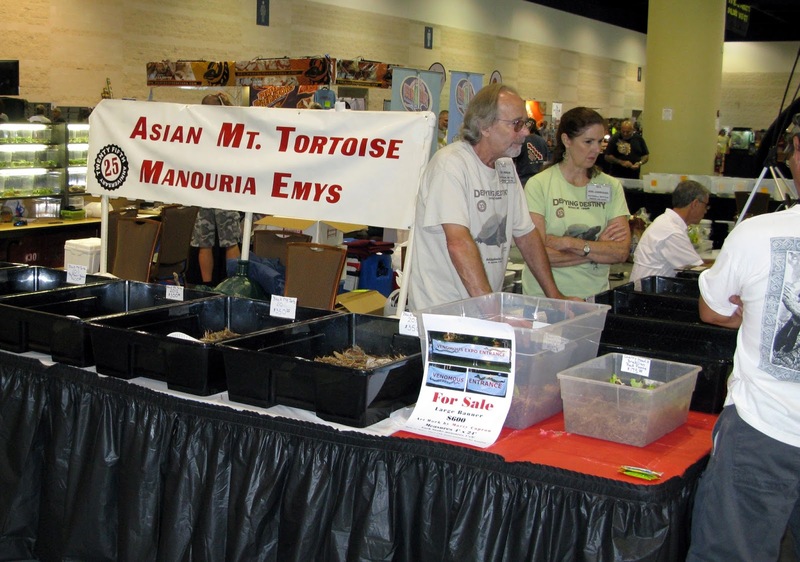 I was also hoping to pick up at least a few baby Chinese Box Turtles. In fact, these were my prime targets. 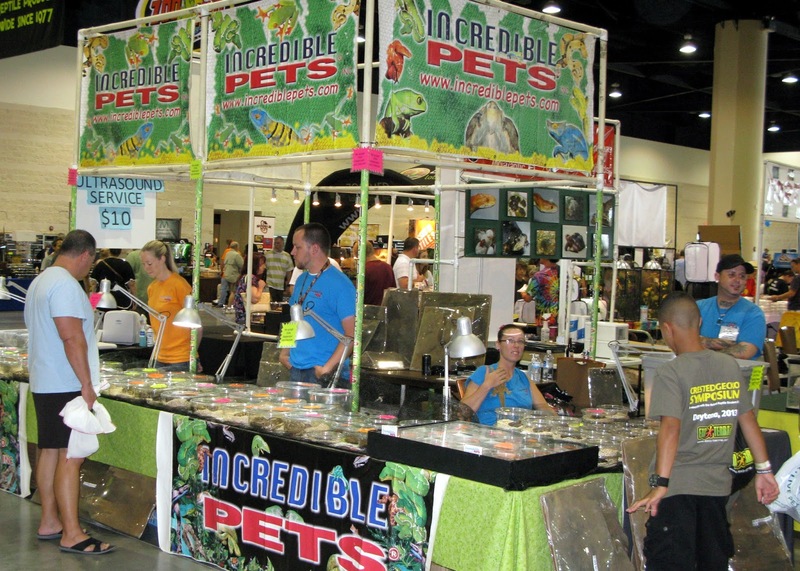 I would have spent all my money of 4 or 5 of them and not bought even one other animal but only one dealer had them and by the time I got to his table, on Saturday, he told me he was sold out of them. 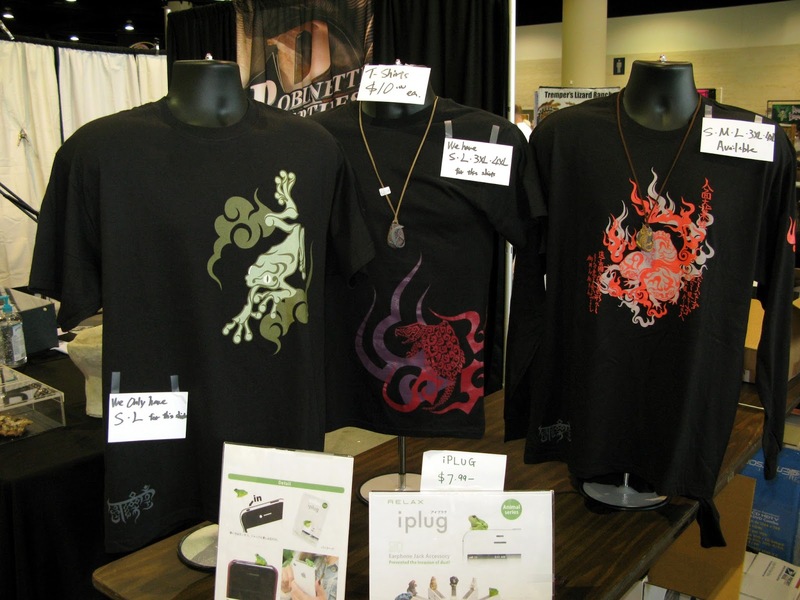 Mysteriously though, he had two of them suddenly appear on Sunday but at $150 each they were only an average deal and were not for me. 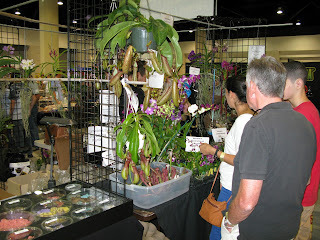 Anyway, most of my cash was depleted already because of what I bought at the show and the auction on Saturday. 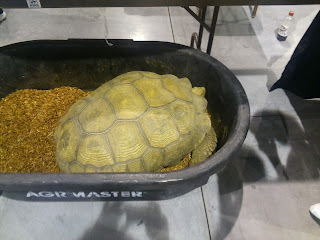 I have to repeat again though, the variety and amount of turtles at the expo was pretty amazing. 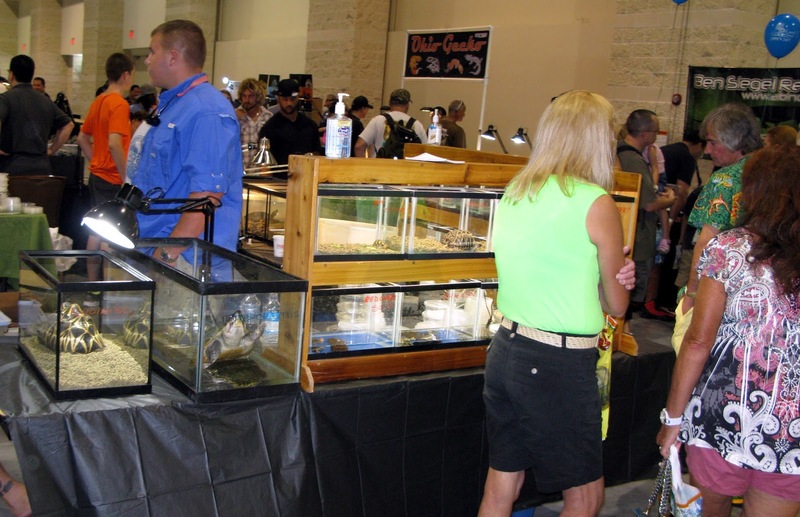 Being Florida, I guess it would be expected that alligators would be at the show, at least on display. In fact, they were on sale. Mind you, not your average alligator but ones a bit more expensive - albino alligators. You will be surprised to see the asking price that I will show with their pic below. Amphibians were, in my estimation, sorely lacking. There was one dealer offering dart frogs, another couple or few offering horned frogs and I think one with axolotls. I don't recall seeing many other amphibians, in fact all I can think of now was one other frog and a few blue tailed newts, the newts were display only. 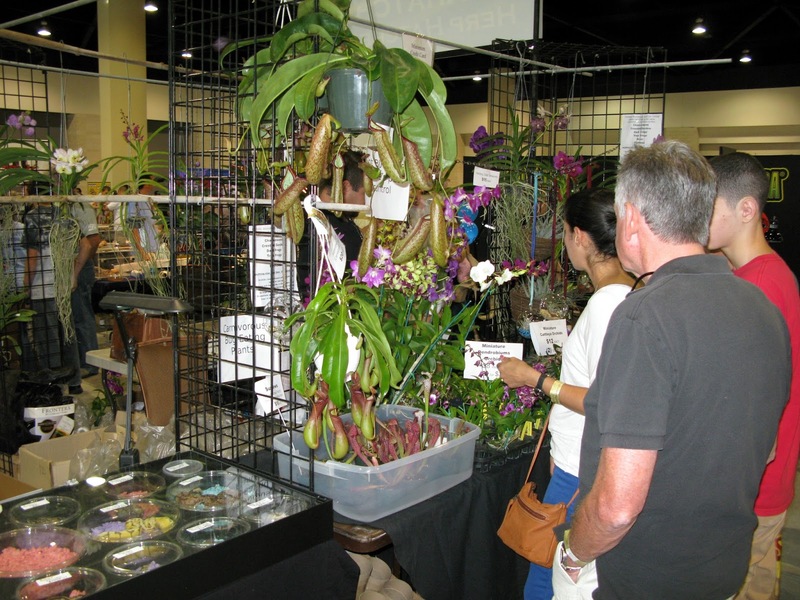 I should add, after the show on Saturday and once I had decided to stay overnight, I attended the auction to help fund PIJAC and maybe also USARK. The auction was in fact two distinct auctions - one with live bidding and an auctioneer offering individual lots and the other a silent bidder type where you walked around many tables with items up for bid. 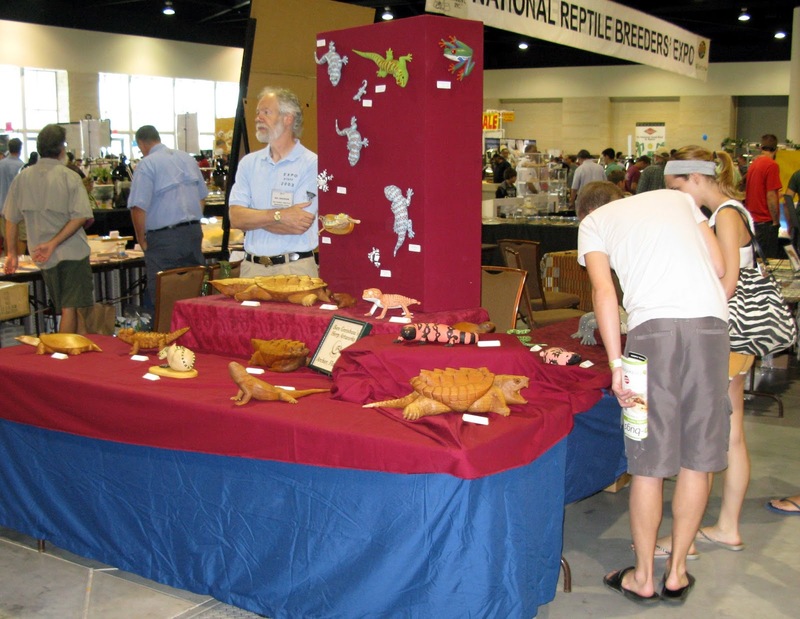 The items up for bid, in each auction, consisted of live herps, herp keeping accessories, and other herp related items along with some non-herp related offerings. 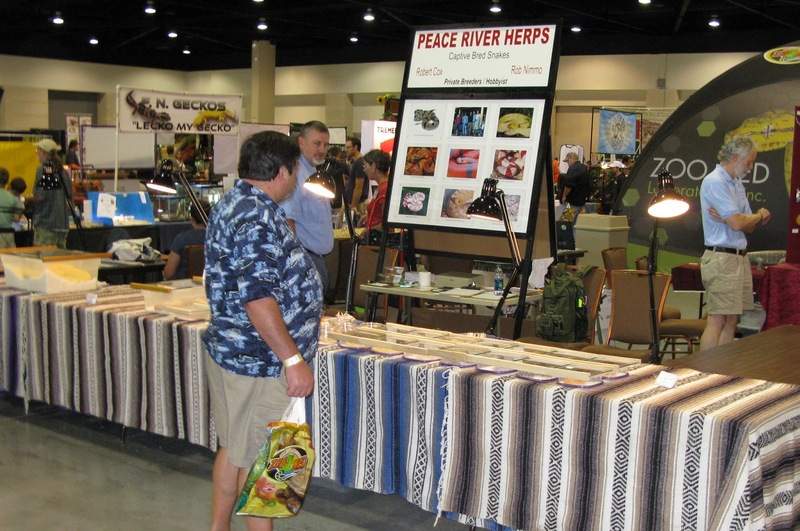 The auctions ran concurrently in the same room. 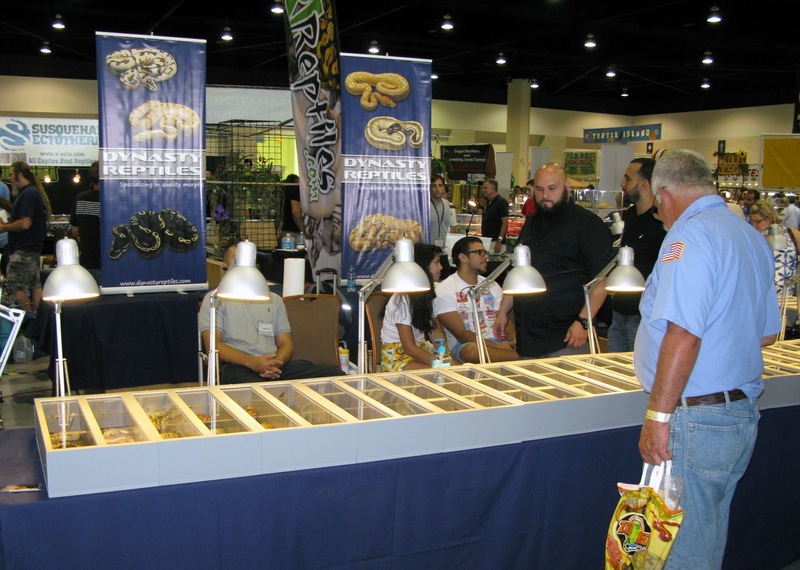 While buying snakes was the furthest thing from my mind while at this show, I saw that Vin R had donated at least one ball python to the silent auction and I decided to bid on it (knowing he offers only high quality animals and not really expecting to have the high bid). As the live auction went on, the silent bidding also continued. Near the end of the live auction and thus near the close of the silent bidding, I noted one woman kept returning and bidding higher than each of my previous bids. I told her not to bother bidding because I would just outbid her and it seemed to have the desired effect - she said she would not stop until she had the high bid. I don't know if I should say shame on her for fibbing or shame on me for believing her but you can guess who wound up the owner of that snake and it was not her. At least the bid was about $30 or $40 under its value. I also picked up another ball python that had a bid up to $175 and had been valued at $200 by the person who had donated it. Well, he mislabeled it as a female and changed that to male during the bidding. The bidding on it just stopped dead as if the snake was just run over on a road. When time came to pay for it - no one claimed it. Come close to the end of the night, those still in the hall had the opportunity to grab whatever auction items had not been claimed by the people who had bid on the silent auction offerings. 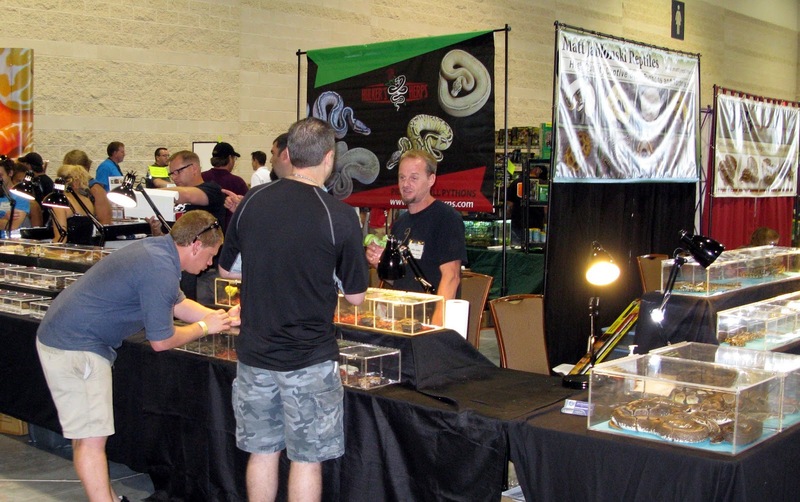 I grabbed that snake and offered the lowest bid for it. My offer was accepted. 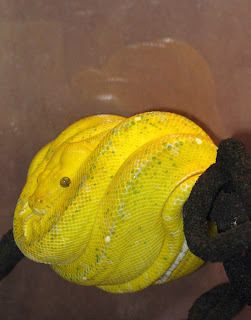 I now have a male BP, heterozygous for albino and 50% het for pied, that I will be offering for sale. 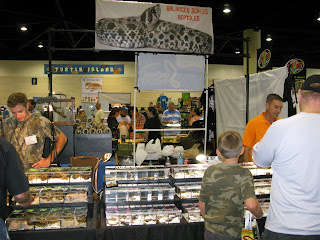 In addition, I picked up a few other items but no other live animals. 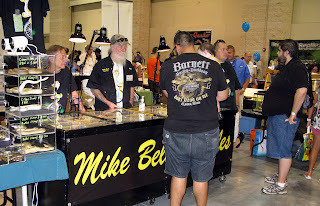 As I said, I also attended the show on Sunday. On Sunday, I picked up two baby Map Turtles. Sort of an impulse buy for me but very inexpensive, I paid $15 for both of them. As for my views on the show, all of my feelings about the show were based on my personal observations. Granted, I might have missed something here and there. I will say though, since I wound up staying overnight and thus visited the expo both Saturday and Sunday, and stayed until closing on Saturday and just before closing on Sunday, I saw almost everything that was offered after abut 1:30PM on Saturday. I looked, or tried to look, at every table's offerings. 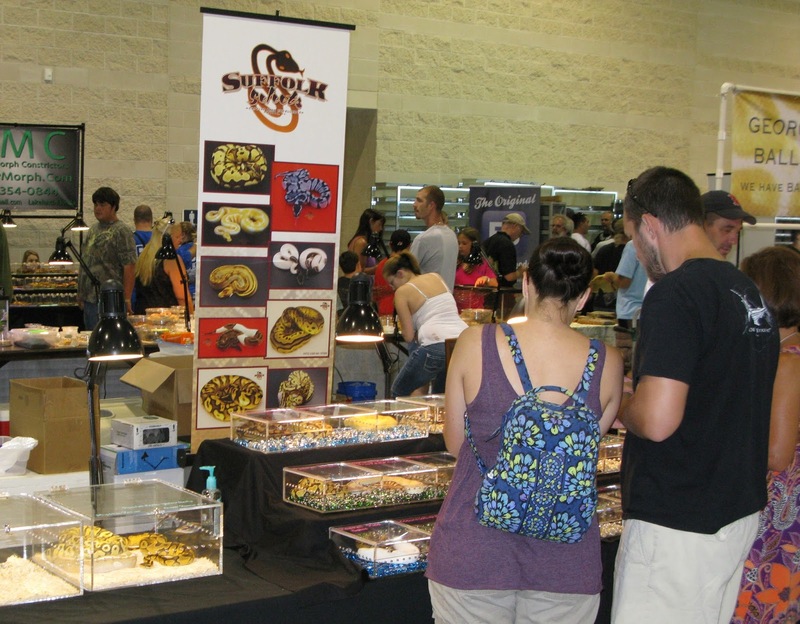 Saturday seemingly was a much more active day as far as sales went. 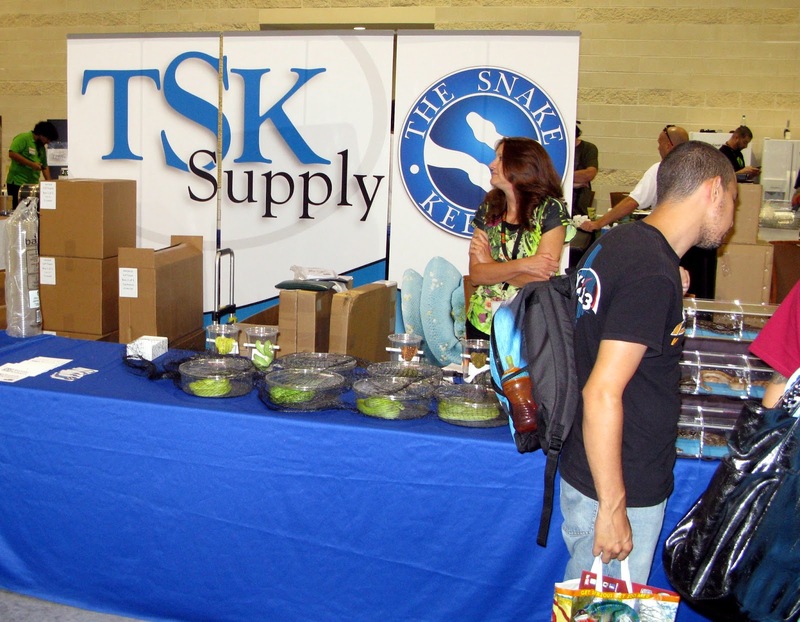 A lot of people were buying then. Sunday looked more like family day out at the herp show. 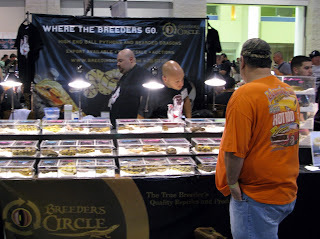 Both Vin Russo and Rich Hume, who were both at the show as vendors, pretty much summed it up as being that way but with Sunday at least having a few serious buyers early on in the day. By the way, even though I was somewhat disappointed because of my prior expectations, I had a good there. The show was only somewhat of a disappointment to me because it was not as big as it once had been or as I hoped it would be, and because of the lack of variety. 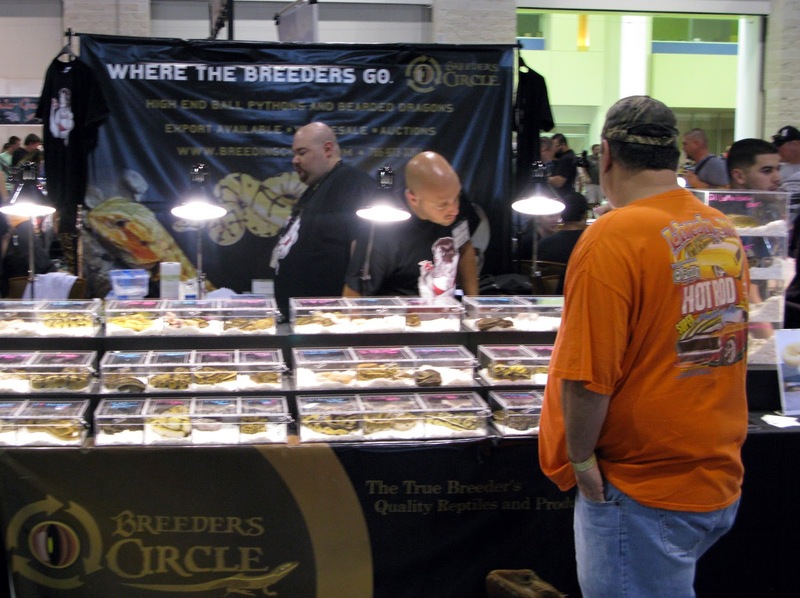 I guess other find BPs all that much more attractive and if they sell, who can blame the dealers for presenting them. 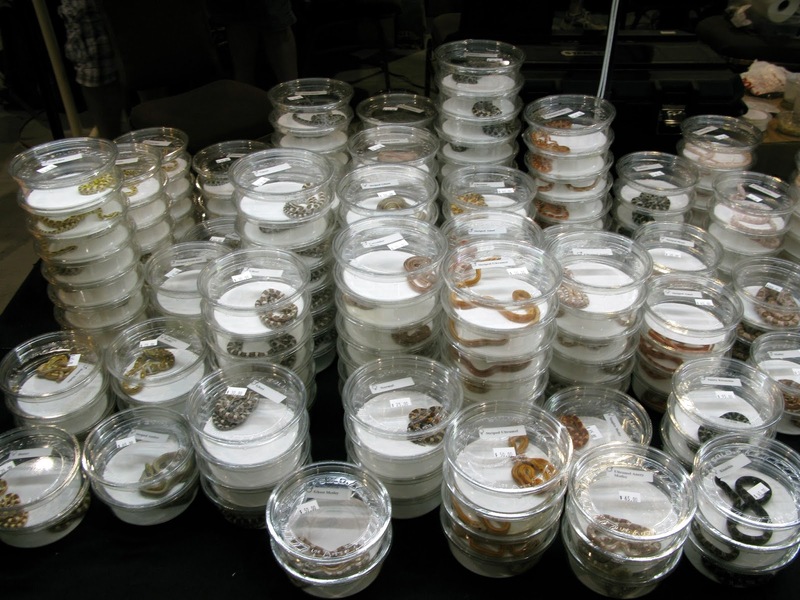 I would have enjoyed it more though, despite the smaller size than in years gone by, had there been more variety. 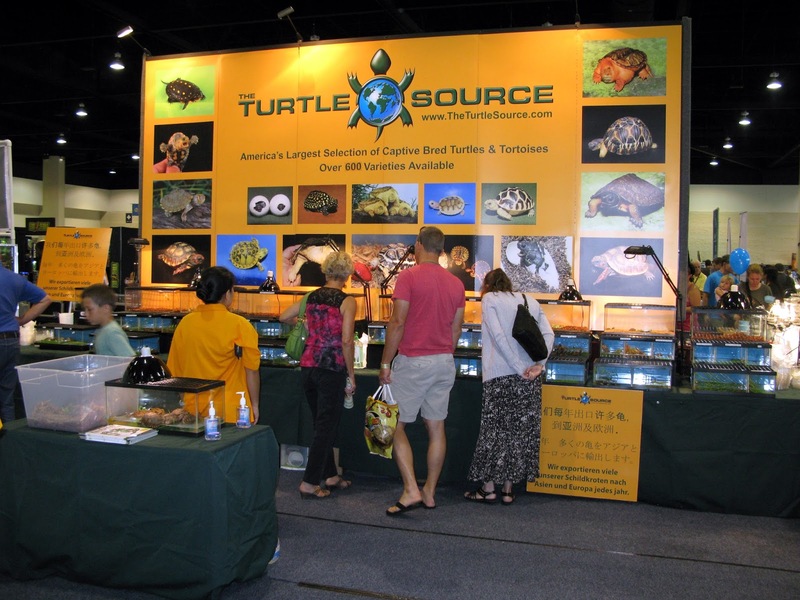 That would have made the show truly very good to excellent (it was very good to excellent in some regards such as the variety of turtles and tortoises). 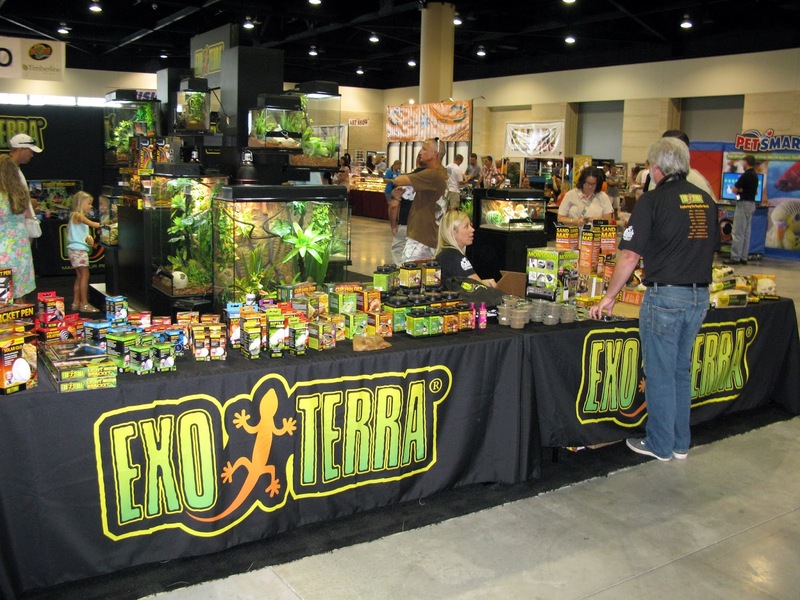 As it stands, I would rate this expo as average to good. There were certainly some excellent prices to be had if you shopped around for what you wanted and that helped the rating I just gave. There certainly was no lack of variety in the price spread on things in which I was interested. 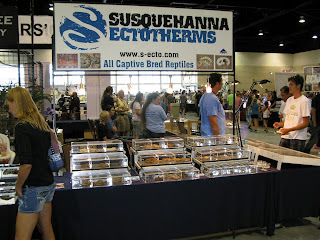 Some prices, for the same type of critters for which I was shopping, varied by as much as $70 apiece. 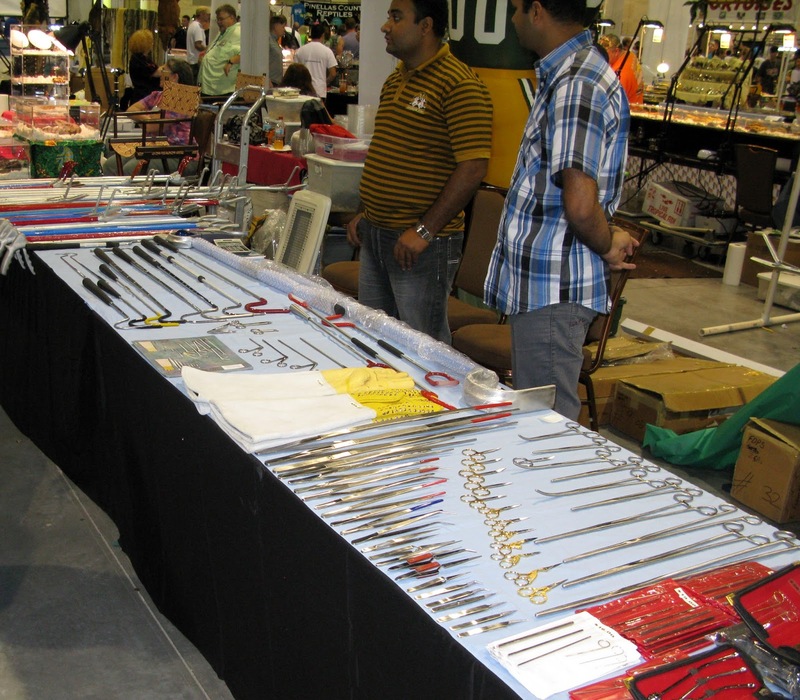 In addition, you could better the price not so much as by haggling a lot but simply by asking once if they would sell at your price. For instance, I asked a dealer, who was selling redfoot torts, if he would come down in price by what amounted to about 20% off if I would buy four of them. He upped my offer by $5 and I bought them. 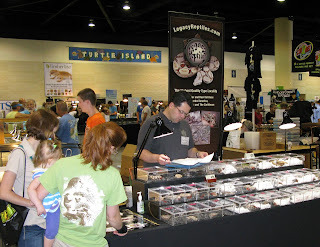 I also got a 25% discount on the two map turtles just because I asked - and I only asked once. It was nice to get some herps that I wanted at good prices. (Even with shipping added, the total cost for the herps I purchased would have been more had I bought them in NY.) It also was nice to meet up with other LIHS members: Vin R, Rich H and Ken S. I was hoping Ed B would stroll into the show, now that he lives in FL, but I did not see him if he did so. The rest of this post will be in pictures, a lot of them. On Saturday, I had forgotten my camera in my car and so only took a few pics with my lousy cellphone camera. 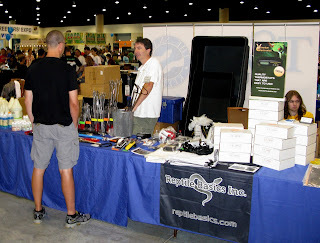 On Sunday, I took pics with my regular camera and while certainly not professional quality, the snapshots I took will give you an idea of the scope of the expo. 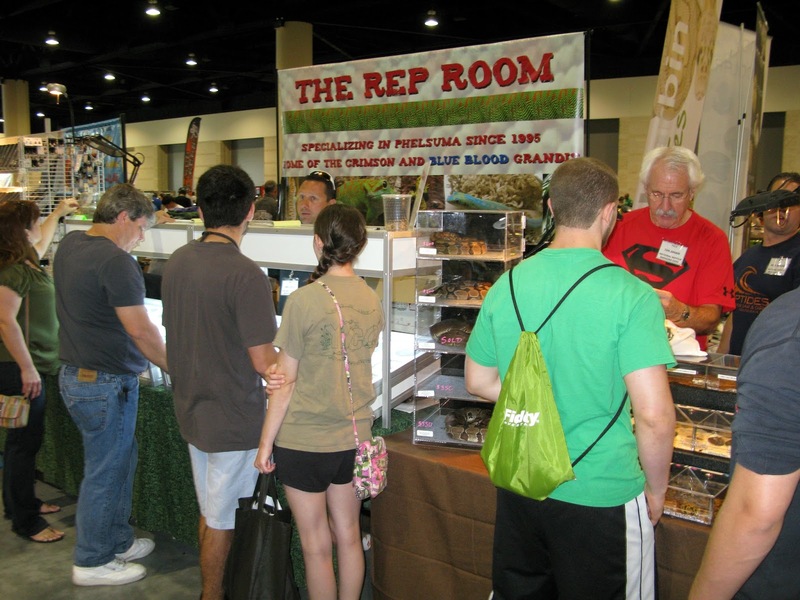 So, if you have never been to one, you can at least get an idea of what it was like at the 2013 expo. The first familiar face I ran across, and smiling as usual. Sorry its not the best quality, I took it with my cellphone. Vin R, down to high end business at CuttingEdgeHerp. Rich were selling corn and hognose snakes as partners. 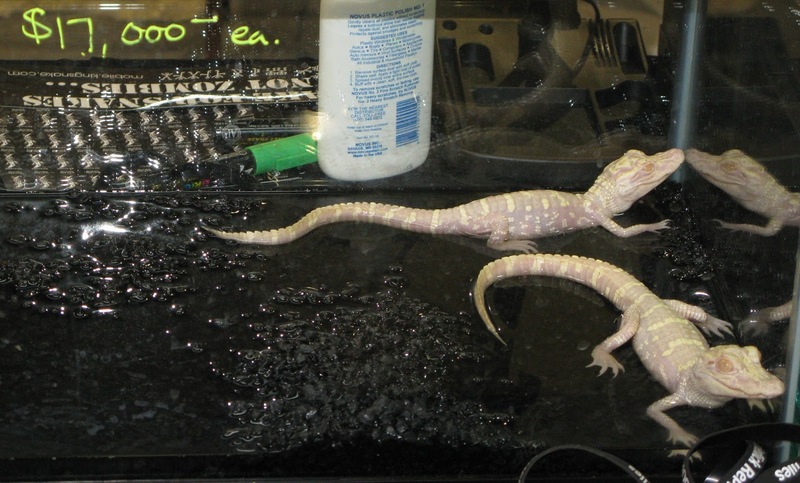 Russo's leucistic balls. 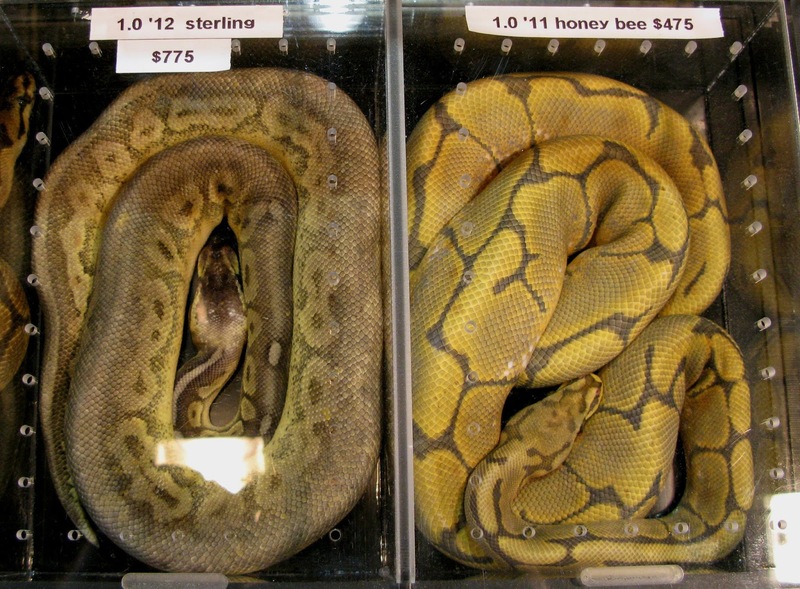 Nice snakes. Some of Vin's other offerings. 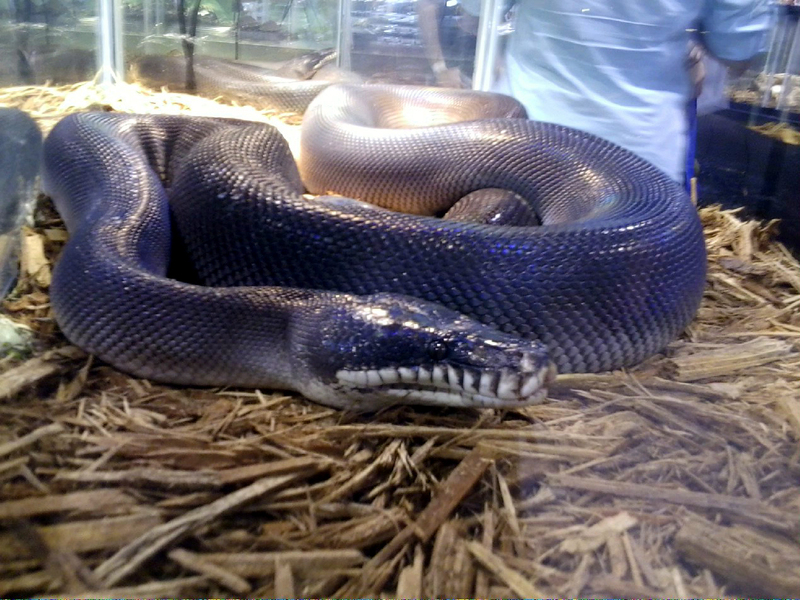 A big mostly black python. 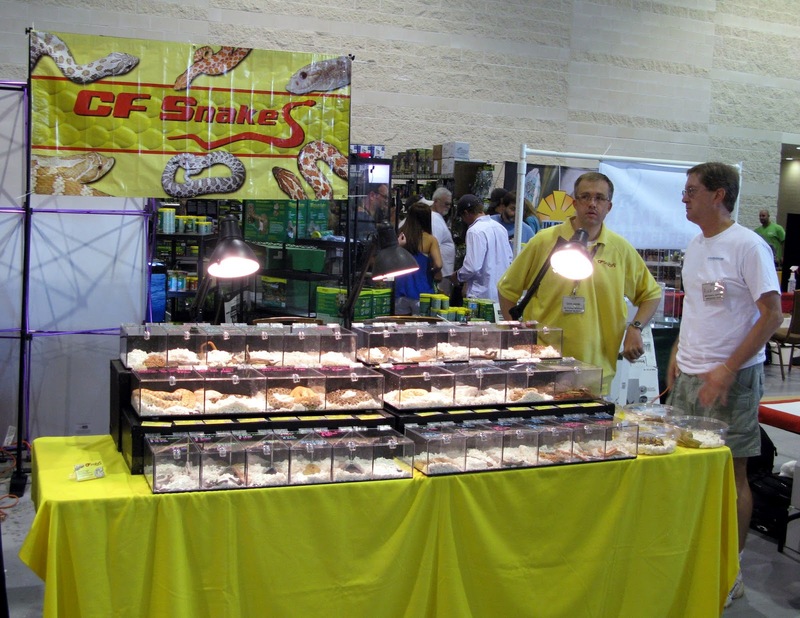 CF Snakes, I think selling only hognose snakes. 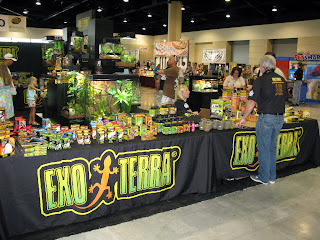 Some nice EXO TERRA displays. maybe not so much fun for the herps though! Yep, I would bet, not fun for the critters. A pair of Asian Mt. Tortoises. As promised more ball pythons and more to come. 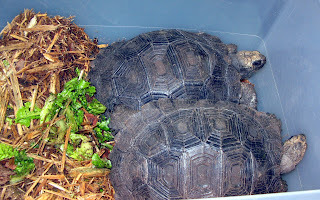 Thought these might have been Pancake Torts but not sure. 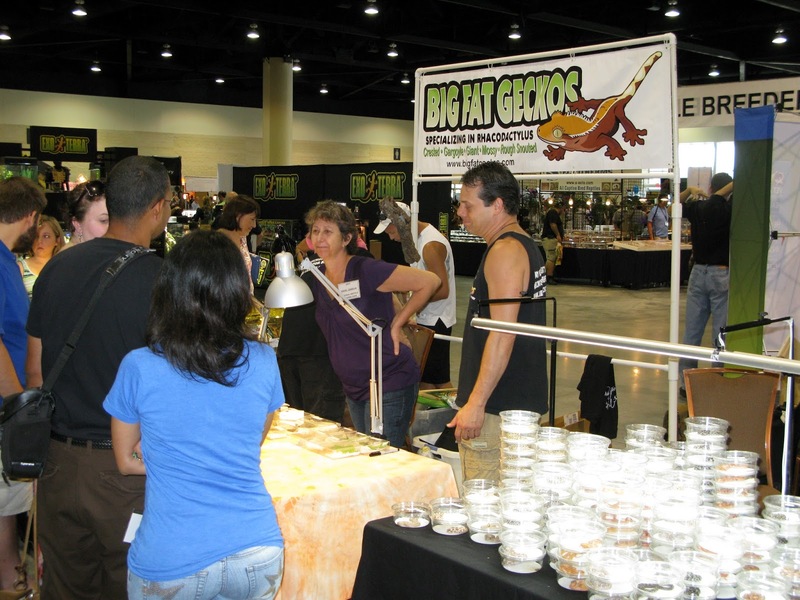 Click it to big it and get a load of that Bearded Dragon. This photo is not enhanced, that was one heck of an orange BD. Definitely had to be a family pet. 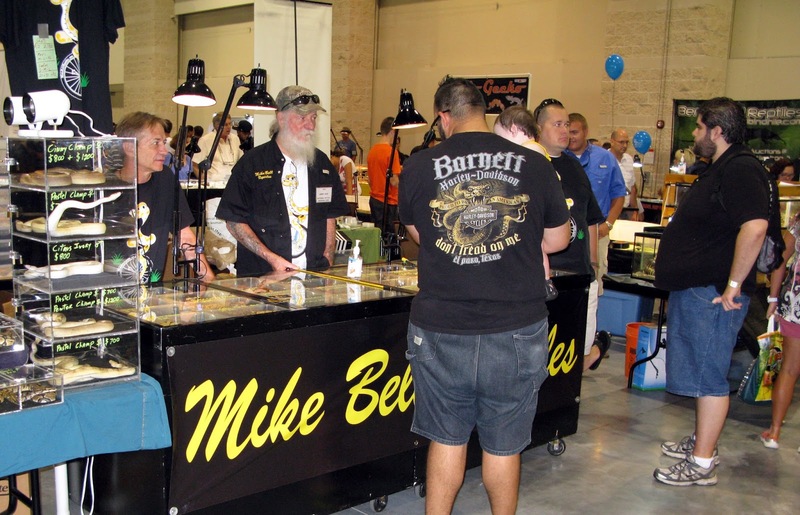 wide to attend this expo Yes, they have BPs on their table. 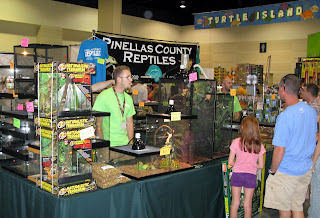 A young red headed girl checking out Pinellas County Reptiles. are they selling a human head? 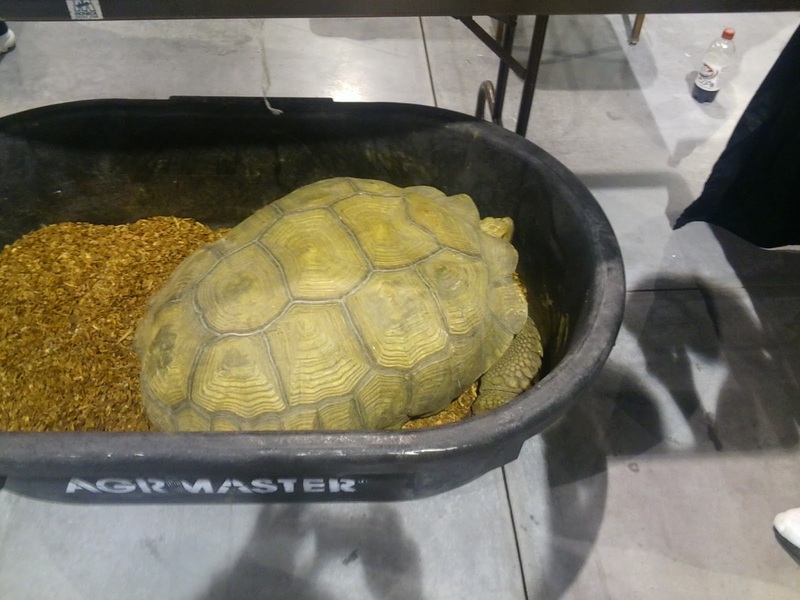 A pretty big Spur Thigh tortoise. this one has a penny atop the shell for scale. different as at least one wallet was made out of BP skin. BP skin as is the one on the upper right. 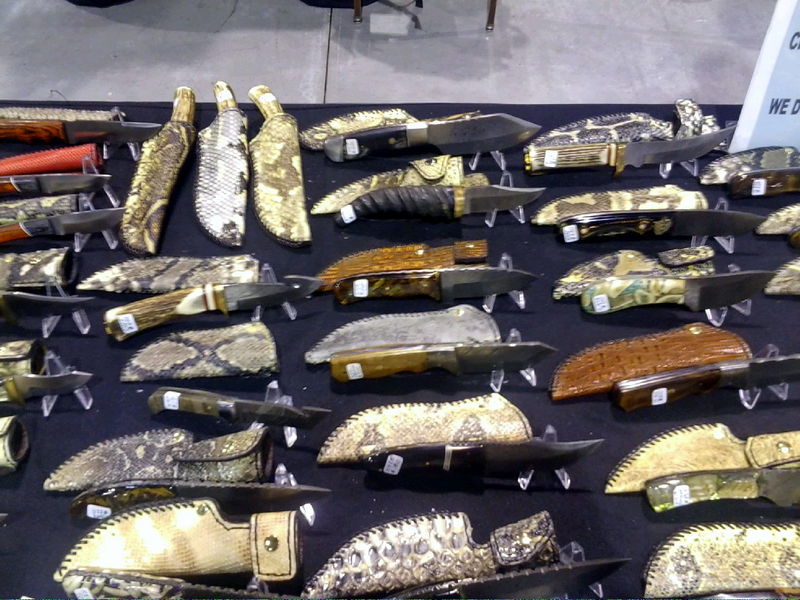 I think all with herp hide sheaths. 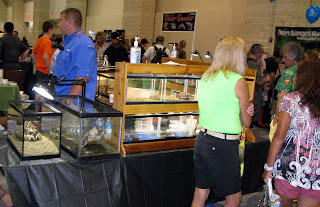 gators on record were wild caught. Yes, they were for sale for the paltry price of $17,000 each. 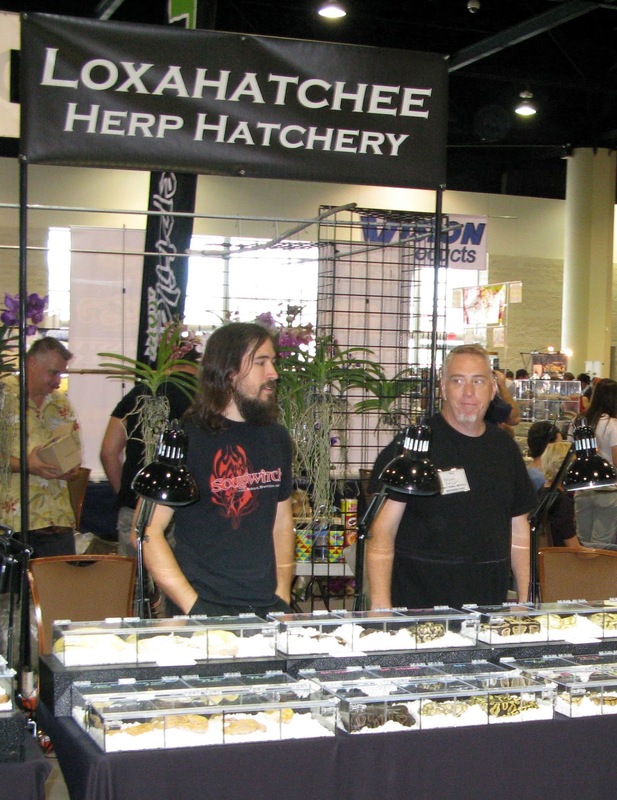 than many of the live herps at the show. Adam Chesla Reptiles and yet more BPs. Constrictors Unlimited and even yet more ball pythons. A nice blood python to distract from all the ball pythons. Business picking up on Saturday afternoon. 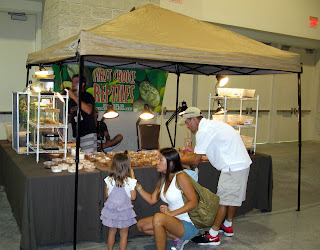 Family Herps and its a family that likes Ball Pythons. 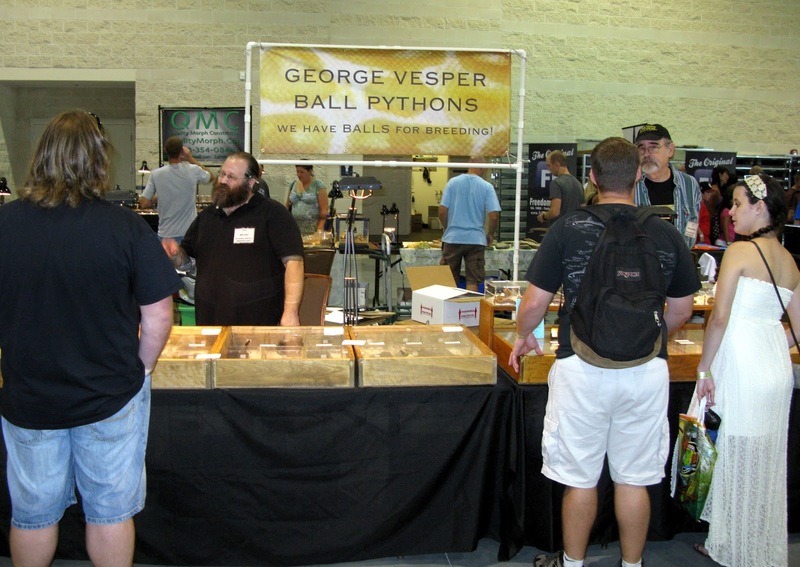 Are they talking ball pythons or Colt Pythons? they too are selling ball pythons. 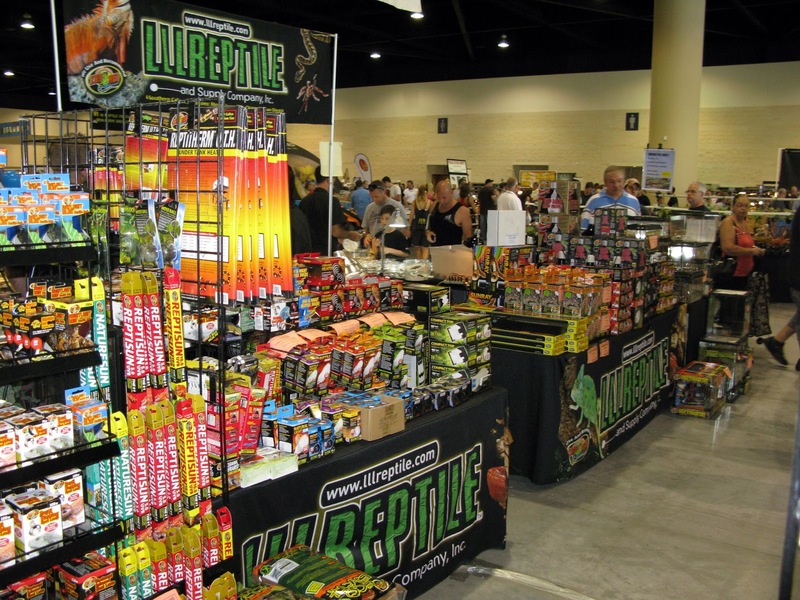 was actually selling green lizards and no BPs. Hermann's Tortoises, as I recall all were females. Family look for their living room, I love it. What did I tell you, yet more ball pythons. 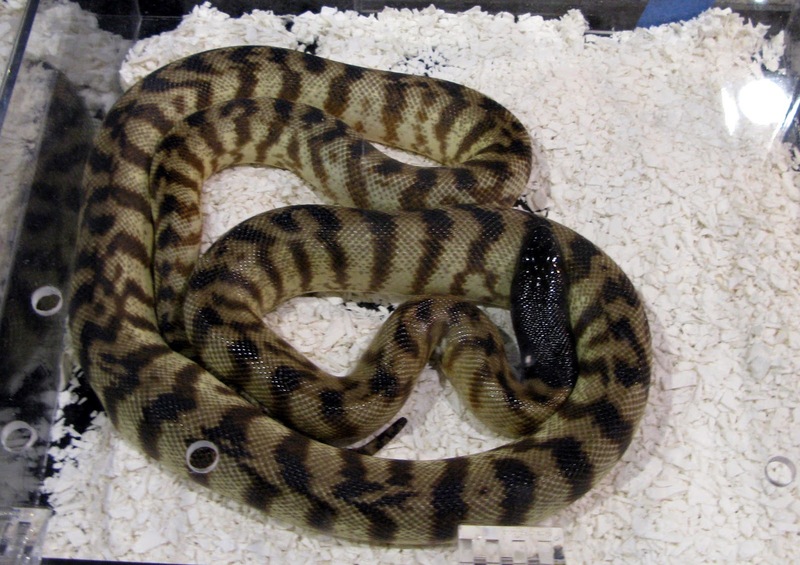 Rows and rows of ball pythons. An orange headed something or other. I meant to take notes but forgot. 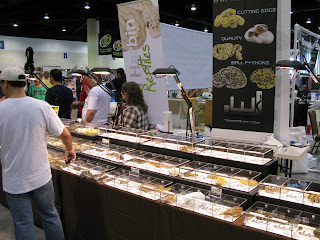 A baby bearded dragon display. 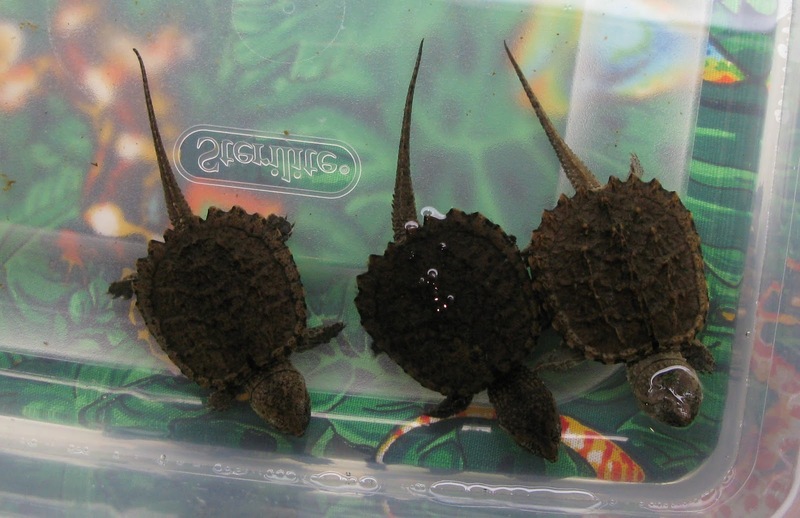 A closer look at some of those baby BPs. Don't forget to click on any pic to enlarge. 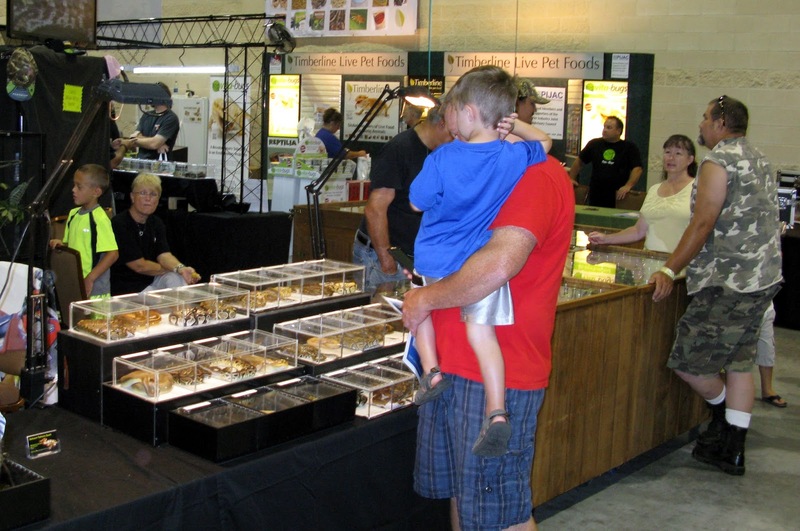 Sure you can hold one, this is a family show. That brought out some smiles. 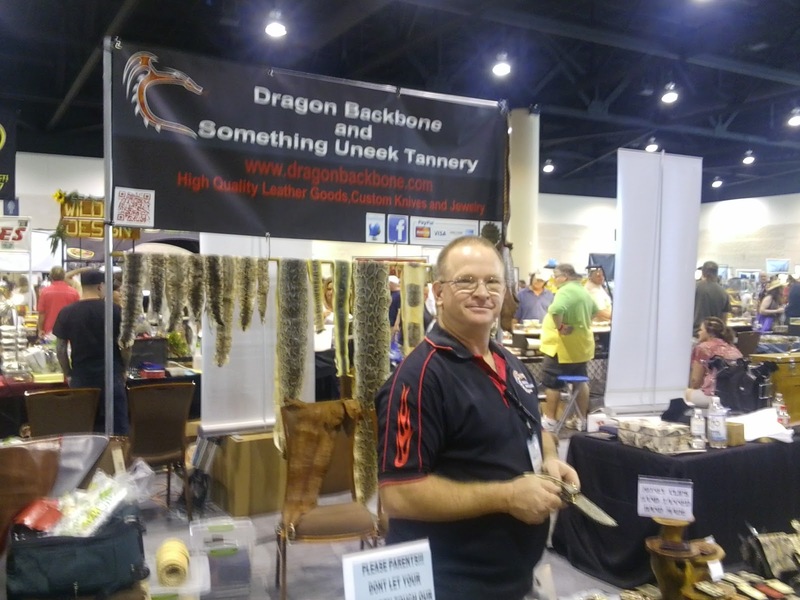 Ah yes, the last three pics were of Bearded Dragon Central. 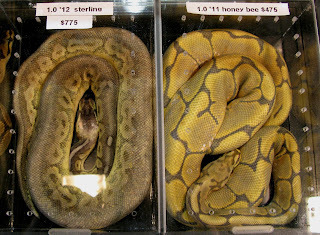 snakes but also were selling ball pythons. Davinci Boas and not a single BP in sight. 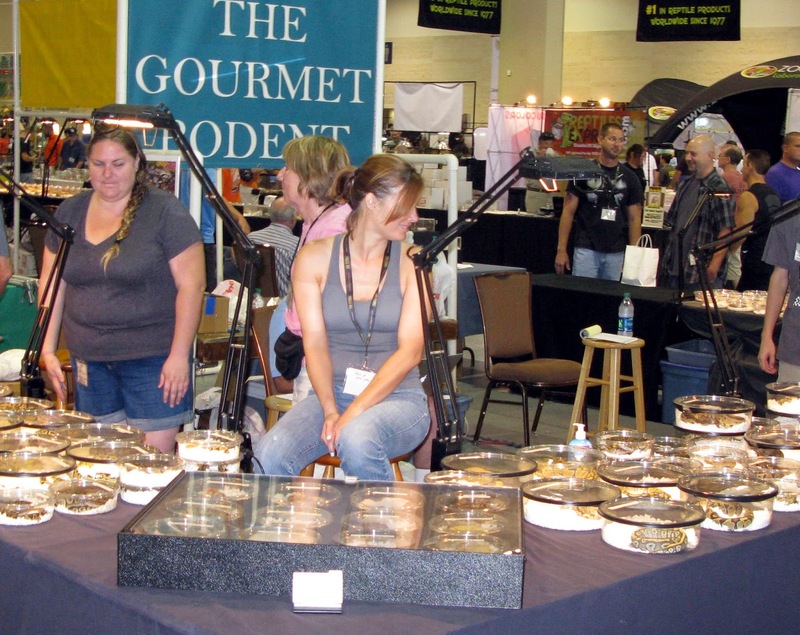 The inevitable jewelry tables, you find them at gun shows too. It seemed the jewelry was selling. 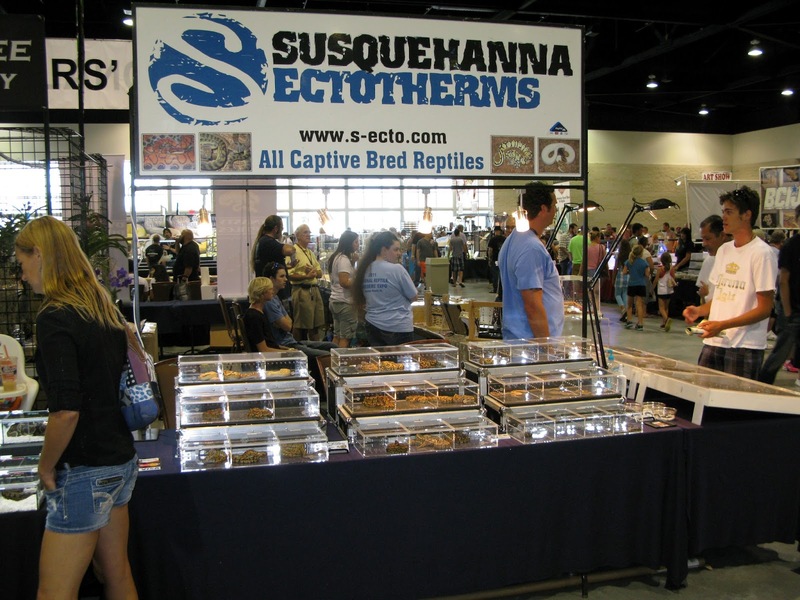 I wonder if related to the Susquhanna Hat Company? 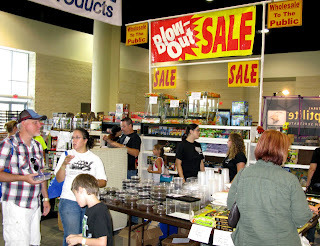 Anyway, yes they were selling BPs too. Not a BP in sight but plenty of turtles. certainly plenty of wood for sale at Sun Pet LTD.
not Suffolk County Long island but Suffolk, VA.
something surely seemed to draw the guys to that table. can offer is Hulker Herps and at least he is not holding a BP. A nice Honduran Milk Snake. but he was out of hard covers. Some kind of monitor lizards. Yes, more of the never ending parade of ball pythons. she do? She smiles and turns her face away (still smiling)! Maybe she had a buyer for one of the BPs they were selling. 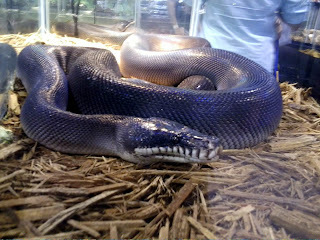 and ball pythons and maybe some other types of snakes. 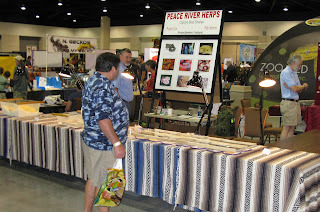 Likely at peace with himself because he was not selling BPs. 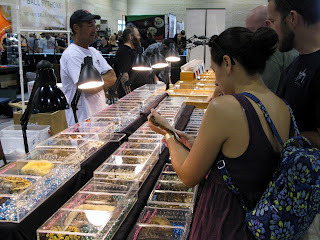 an apparent happy customer shelling out his cash. 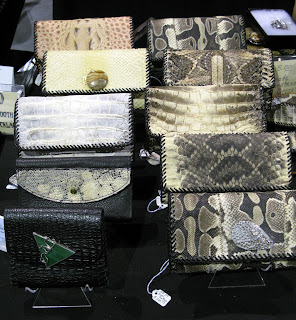 Scherer Serpents and yes those are ball pythons for sale. just about penniless on day two of the expo. 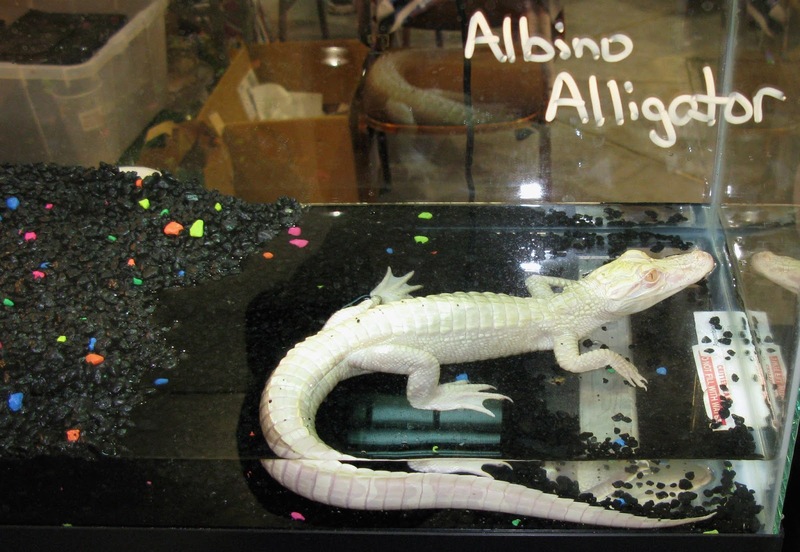 Guess what they are selling at Gulf Coast Reptiles. if eighteen years old or older please). 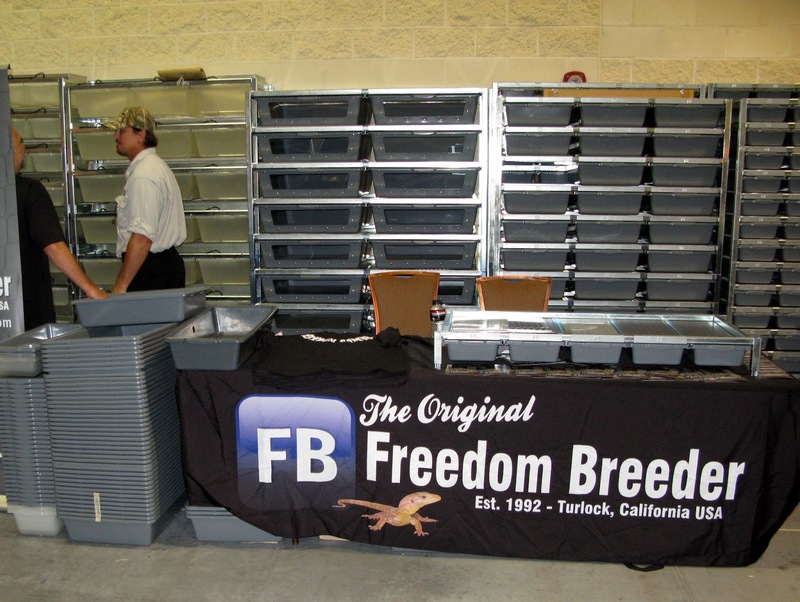 I bet it is easy to guess they were selling BPs. Mike Bell reptiles and yes, they too were selling BPs. pretty big variety as opposed to most dealers. Yes, I am forcing you to trudge on by even more BPs. in FL and they would be easier to keep there than NY. 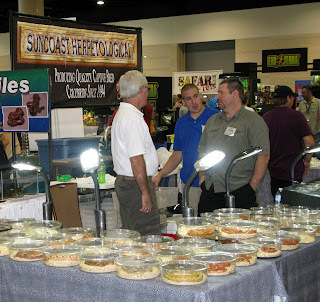 Suncoast Herpetology and not a BP in sight. had a note on it saying he would inscribe and autograph it. The high bidder never claimed it. I had a couple of bids on it. I grabbed it at the end of the night and paid my high bid for it. ball pythons for sale but believe me it was true. 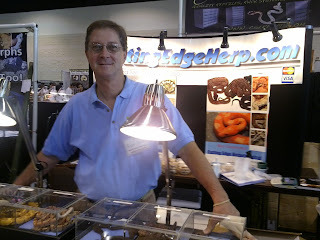 I was not all that wowed by their prices. Wow, corn snakes and only corn snakes. 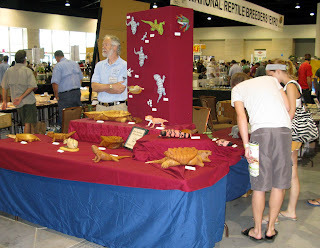 Turtles and tortoises for sale. myself a hotdog after I saw this display. 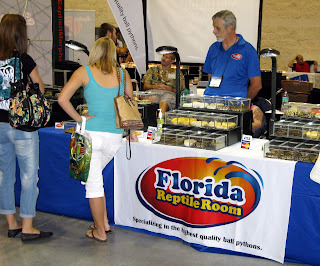 of their table and still not a ball python in sight. now you know, now you know! Yes, of course, they too are selling ball pythons. Whadda mean have we got substrate, ain't you got eyes! at another table is singing her the Siren's song. Give these men a cupie doll, all geckos and not a BP in sight. even had young Russian Torts but not baby Russians. They also had the only Chinese Box Turtles I saw at the show. 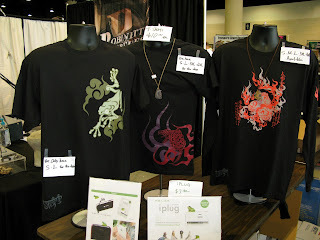 that I saw at the expo and I was looking too. and Big Fat geckos was one of them. seemed to generate considering there were so many for sale. Our friends from Zoo Med. Reptile Basics looked to be selling some advanced accessories. Frozen rodents, they were making business. 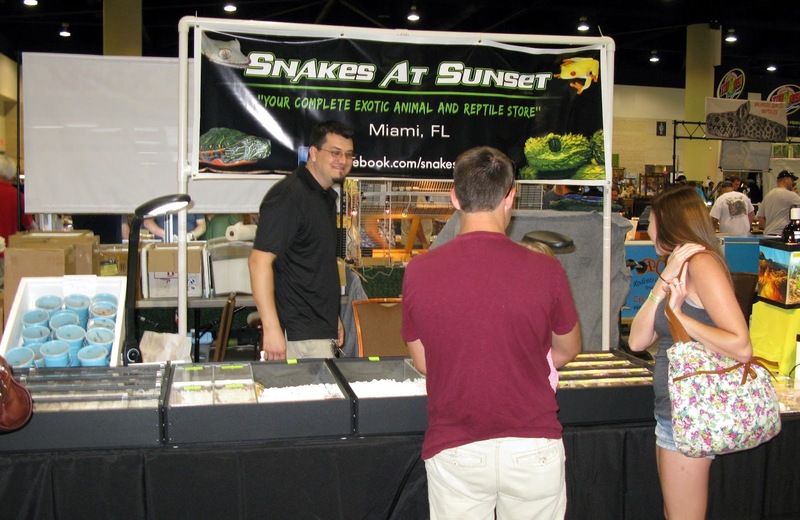 Another lonely and apparently bored ball python vendor. business at least when I took this photo. by this time, for some reason that eludes me. 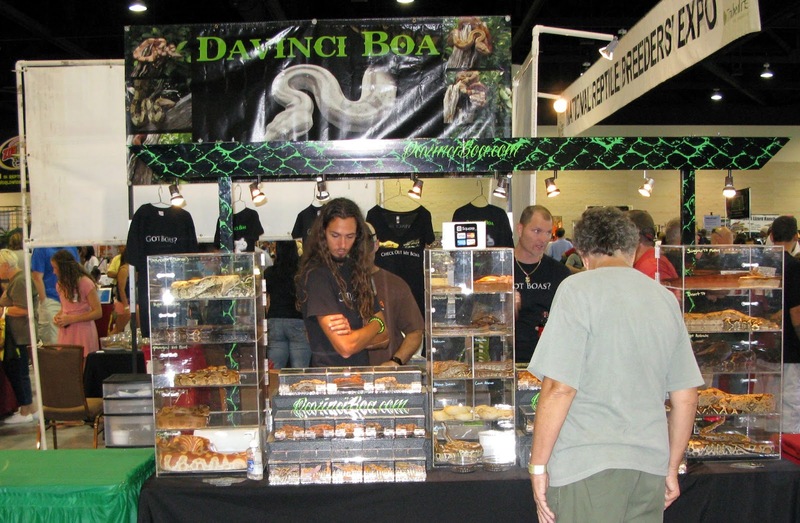 Wow, someone specializing in boa constrictors, what a relief. not at the show but he sure knows turtles. Yes folks, yet another ball python specialist..
moonlit night while strolling barefoot with a loved one. expected neglected to ask what was the exact species. 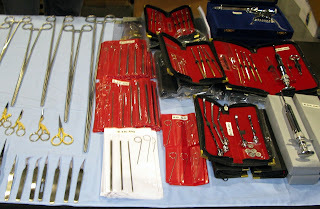 (center) and one of the others. Impulse buy, you bet. preapproved by Fed Ex to allow shipping reptiles via their labels. Mom: "Watch out sweetheart, they bite." 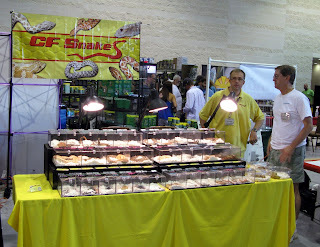 yucky ball pythons that everyone else is selling!" take care of it. Really dad. I'll take good care of it. 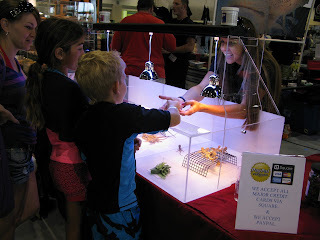 As you can see, I ended the photo display with words that are all too often believed by parents buying their kids a pet reptile or amphibian (or any pet for that matter) - "I'll take good care of it". It amazes me how many parents fall for that one. The more responsible among them monitoring and nurturing their children to become responsible herp keepers, some maybe even of them taking over in the pet care department if their son or daughter loses all interest and others just not giving a damn and acting as if a live animal was a disposable pet to be released into the toilet bowl. Is there a reason I bring this up? 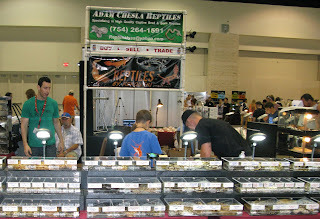 Well, a you can see from the photos, there were lots of kids at the expo and you can bet a good number of herps bought for them by their parents. 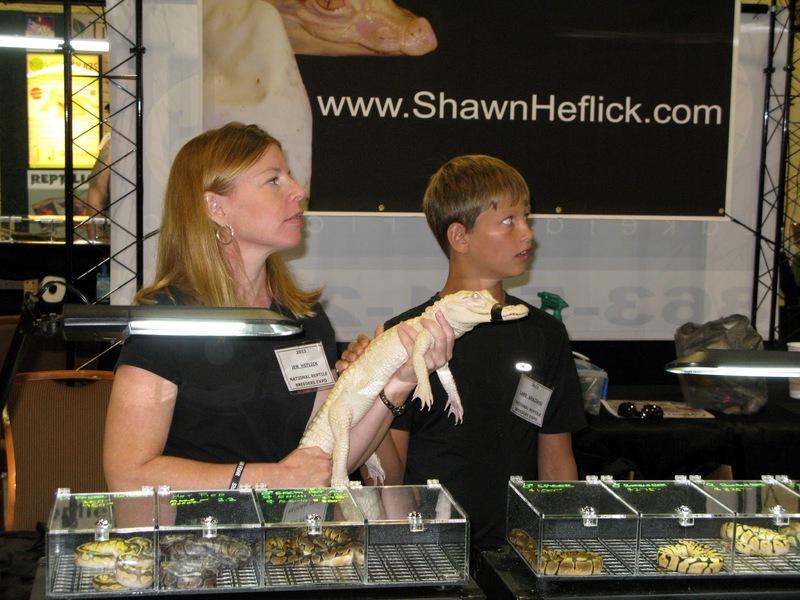 This is just a reminder though, that if you are one of those parents who buy a reptile or amphibian for your child, you have to expect to become the main caregiver for it, especially when younger children are involved. Don't ever forget that and don't buy on impulse. 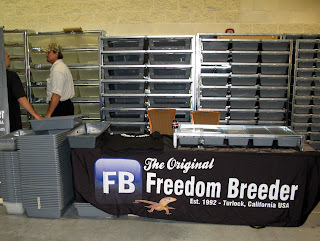 Research a bit first and buy with knowledge as your basis for the choice of herps you purchase. 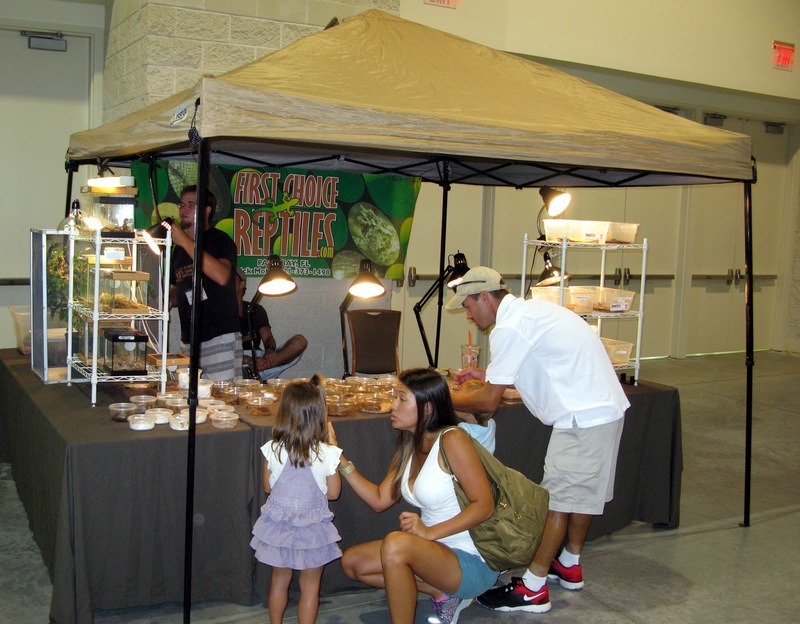 It will be much more of an enjoyable experience for you and your children and much better for the herps. 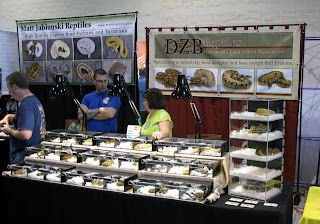 My final thoughts on attending the 2013 National Breeders' Reptile Expo: I, the great procrastinator, am very happy I finally made the trip. 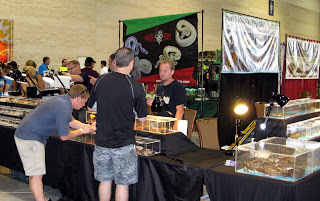 While I had some small amount of disappointment, because of it being smaller than expected and because it truly seemed to lack variety by way of in great part seeming to be a ball python showcase, I still enjoyed myself. In recent years I have gone back to my childhood regarding herps. 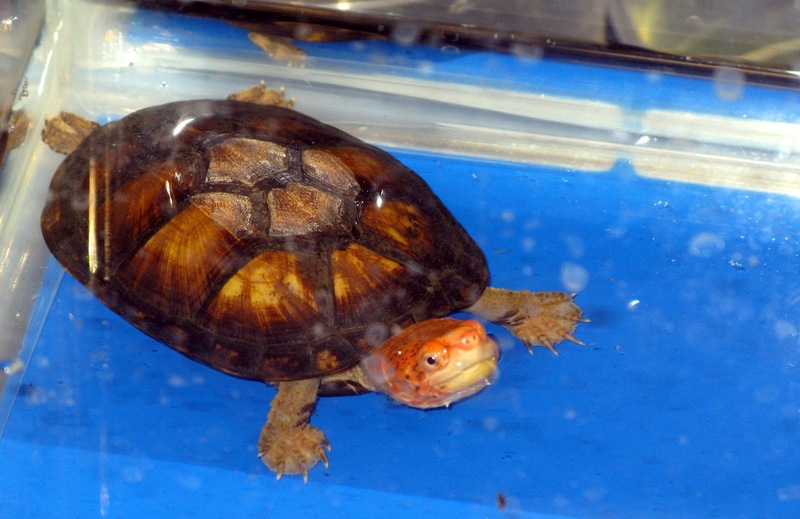 My first pet was a red eared slider and I have never given up my love for turtles and tortoises, ever since, so long ago (take my word for it, it was long ago). 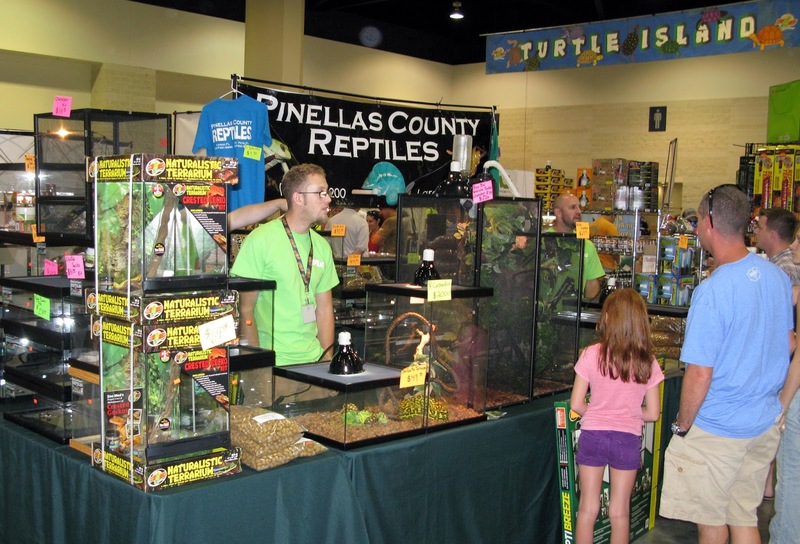 As the years progressed, I kept many more snakes and lizards than chelonia for quite the while - sometimes no turtles or tortoises at all. Lately though, I have reverted back to my beginnings in herp keeping. 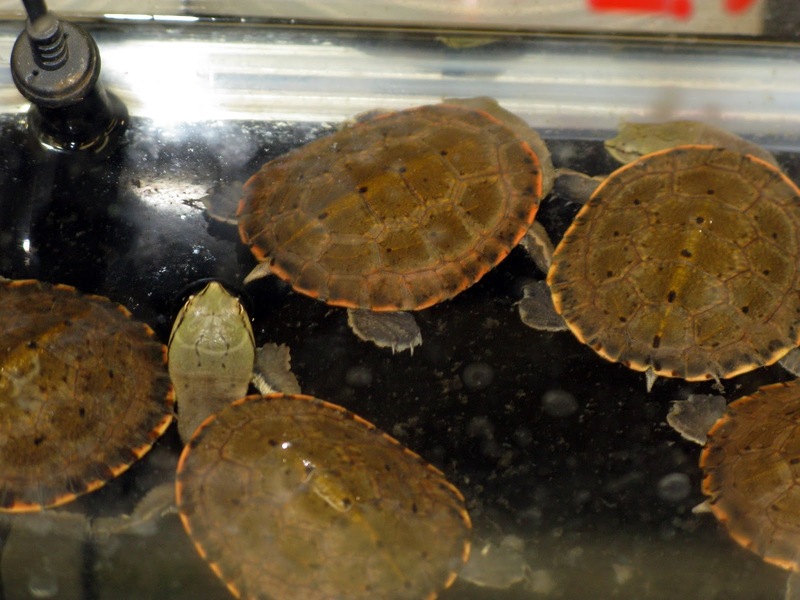 With my most recent purchases included, I now have 5 water turtles and 10 tortoises. 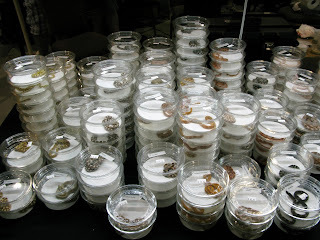 I have some crested geckos, a mossy gecko and 3 adult bearded dragons too. 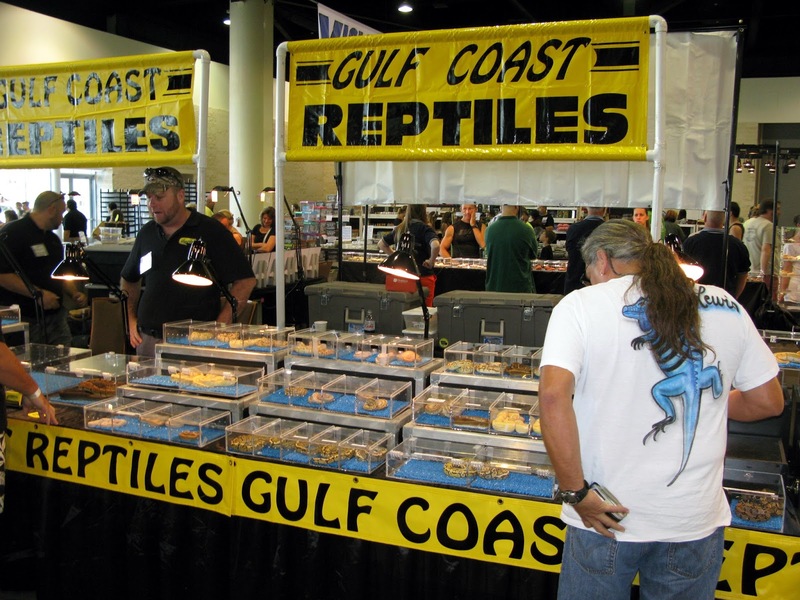 I would have zero snakes except for the fact that on some unfathomable impulse I bid on those two ball pythons that I picked up during the auction at the hotel across from the expo. How ironic, me bidding on ball pythons! Anyone interested in them? If so, I will offer them at a good price, local sales only, first come first serve to LIHS members. Oh well, I am much more into turtles and tortoises than I have been for years and in that department this expo was very good to excellent even though I did not pick up my prime targets of a few Chinese Box Turtles nor any baby Russian Tortoises. 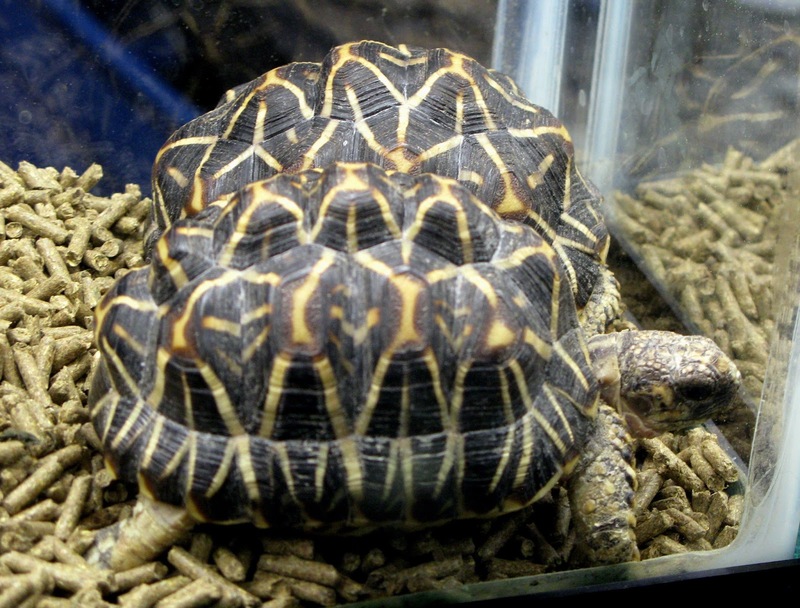 Four Redfoot Tortoises and two Map Turtles and those two ball pythons (rolling my eyes) will have to do. 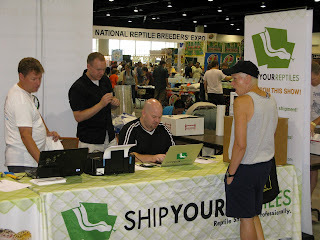 That my reptiles made it home alive and in excellent shape was also a plus, shipped with that Ship Your Reptiles issued label via Fed Ex. 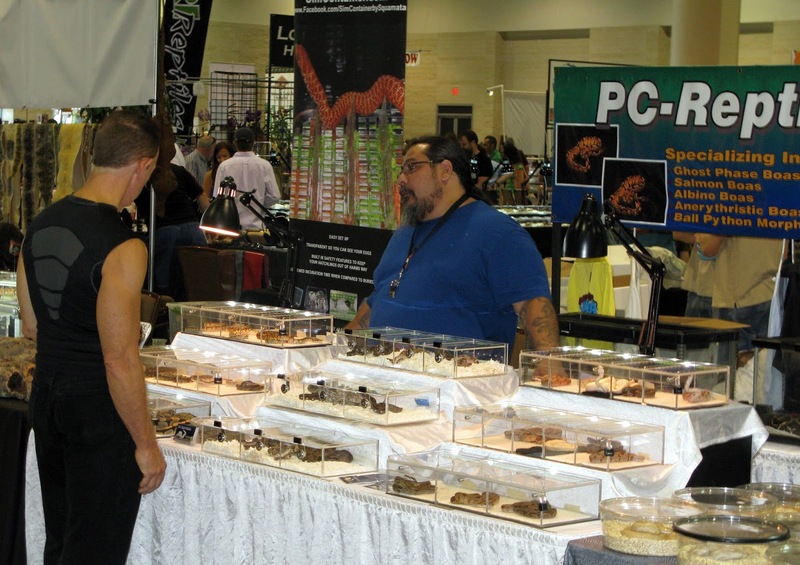 So, yes, I enjoyed it all and it was made so much more enjoyable by meeting new people and by getting to see some old friends, LIHS members, in action at my dream herp show. In closing, let me just add that hope you enjoyed this post, it took an awful lot of hours to put together for you. I'll proofread it later and make corrections as necessary. Right now I have got to find something else to do, I have been at this all day long.